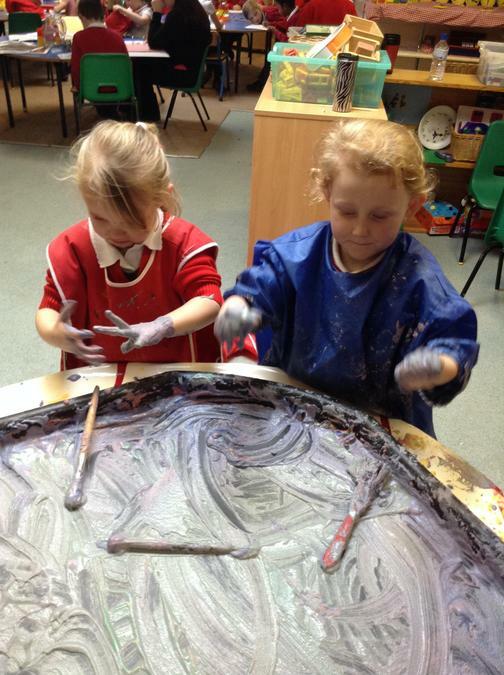 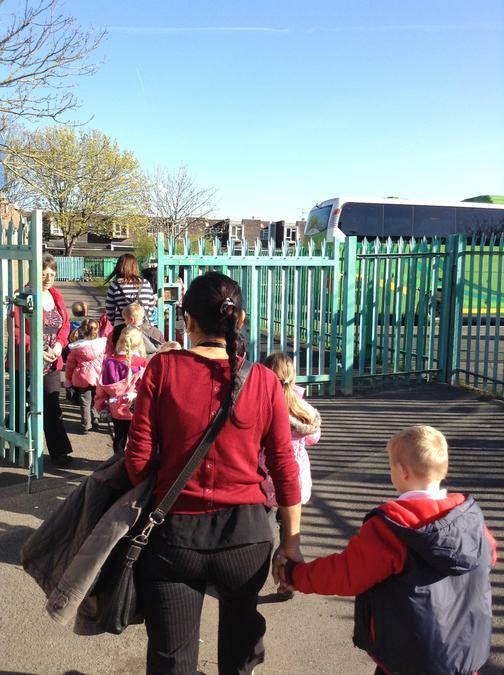 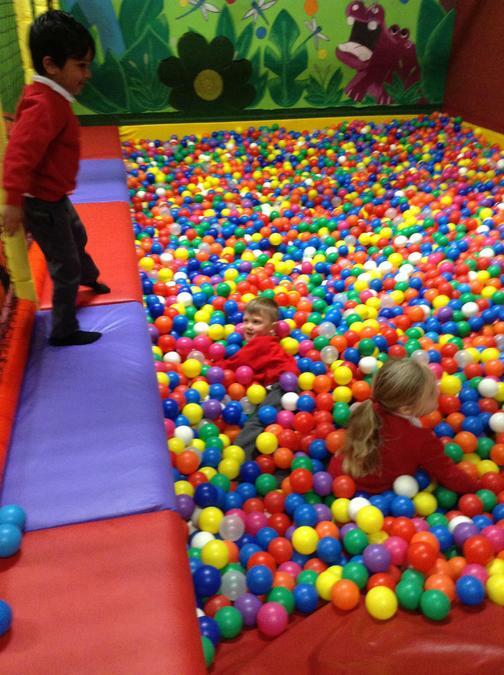 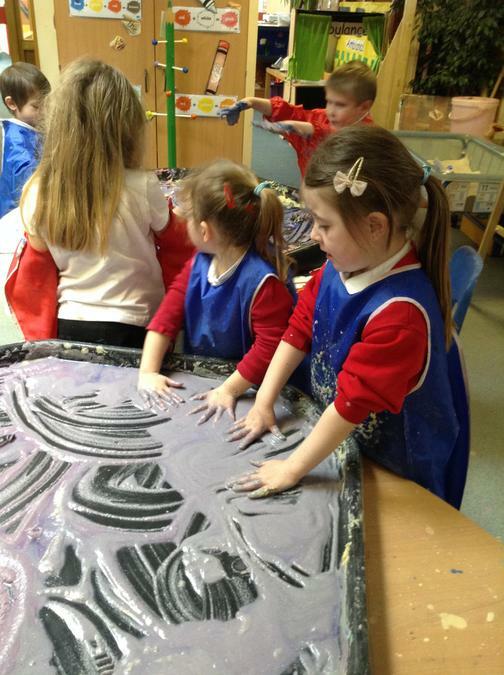 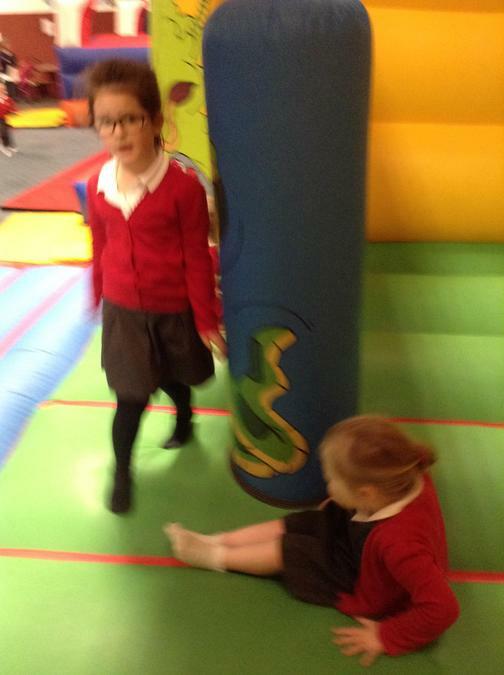 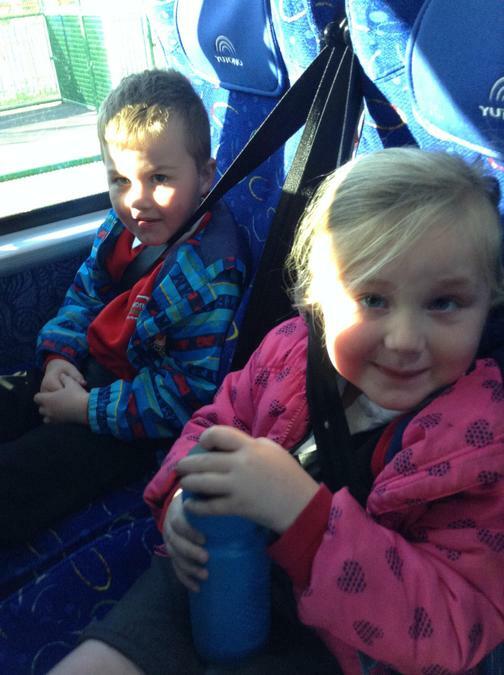 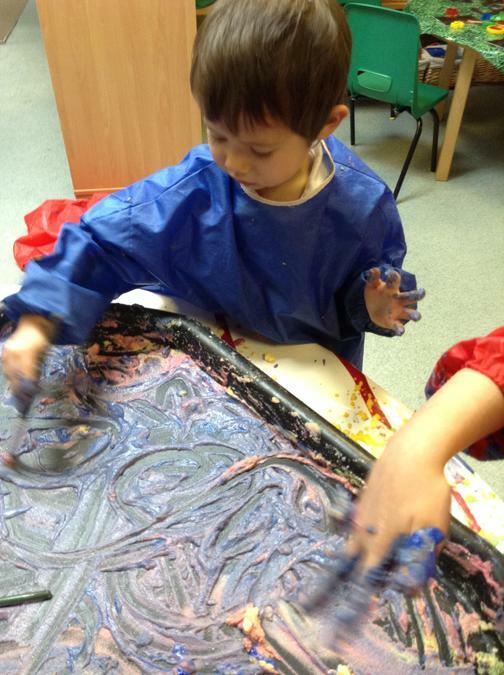 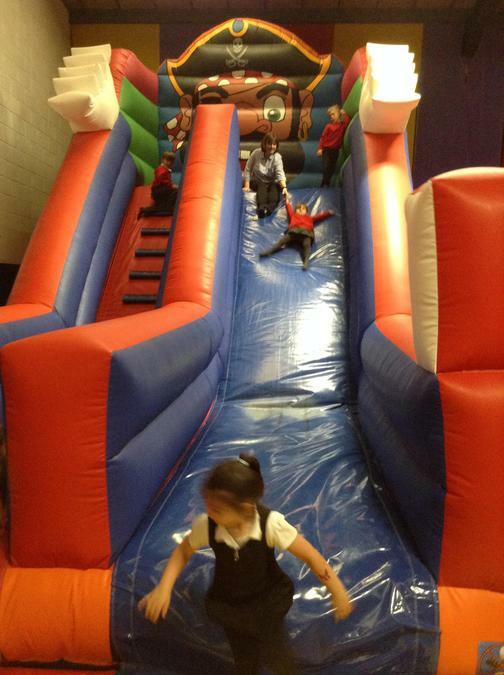 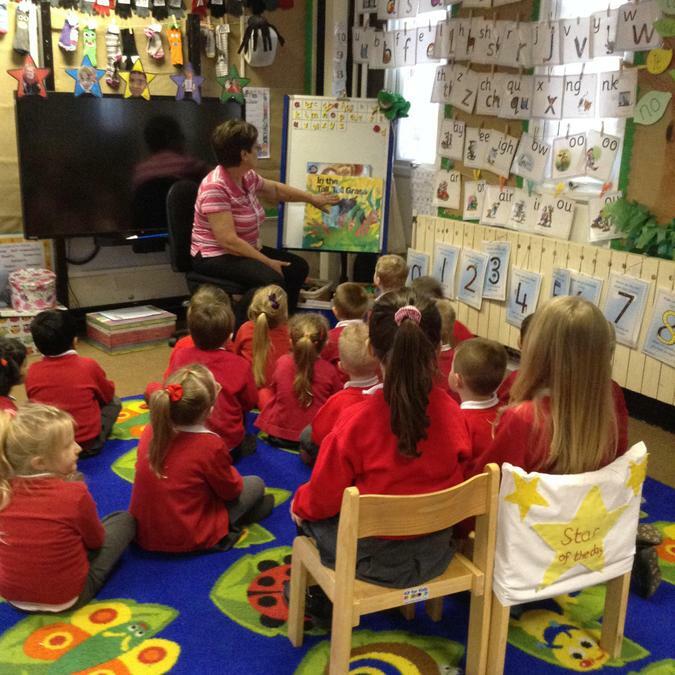 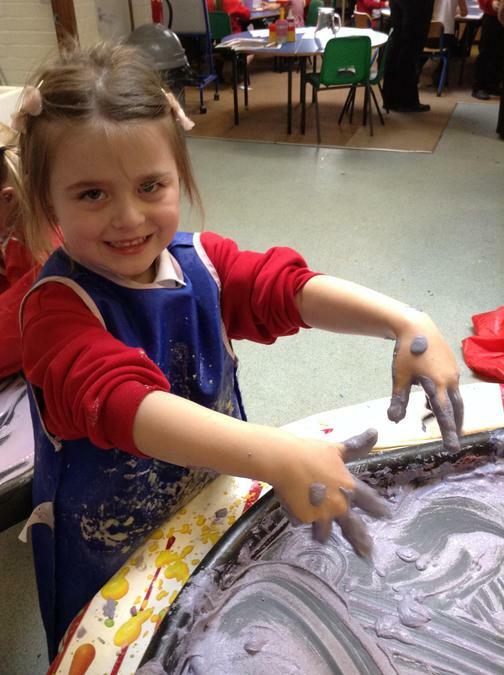 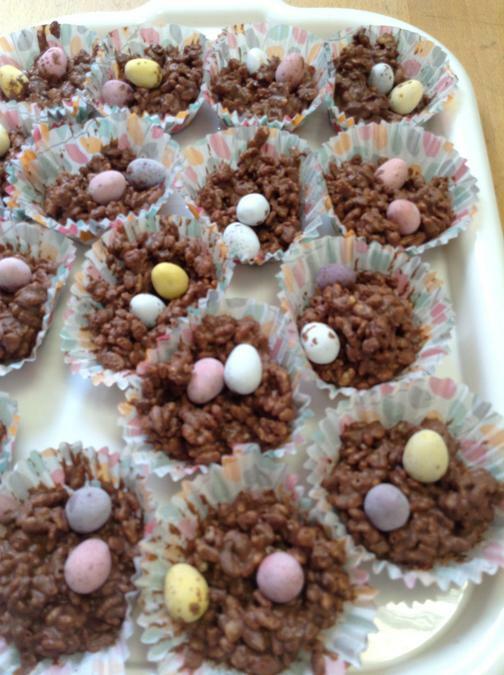 Reception Class have had a busy final week of term, with a focus of an Easter theme. 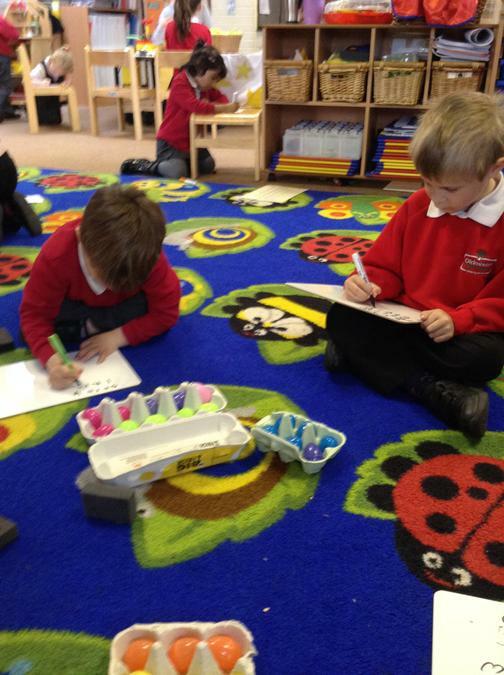 The week started with an exploration of number bonds using egg boxes for 6 and 10 eggs. 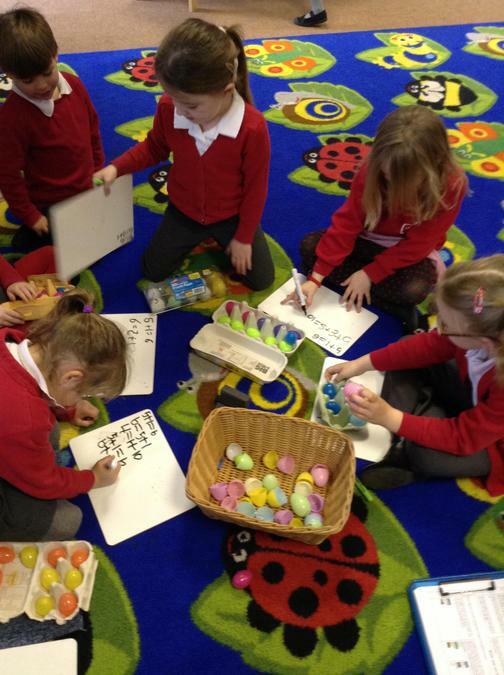 There was a lot of discussion about what the children could see and describing the different ways they could see the total amount of eggs in the practical number bonds. 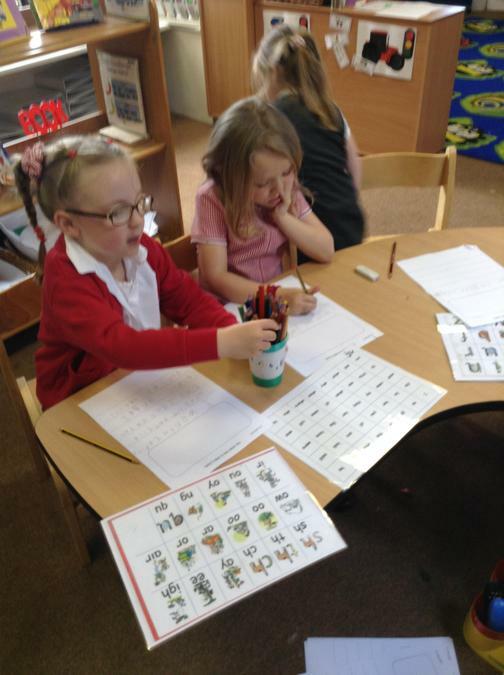 They then started to record their own number sentences to reflect this. 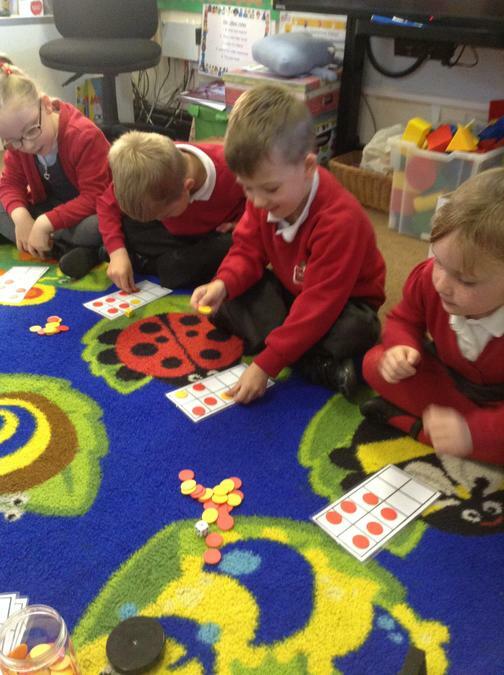 They also extended this into using ten's frames to create numbers unto 10 and 20 by taking turns to roll a dice and collect the corresponding amount of counters to fill their ten's frames. 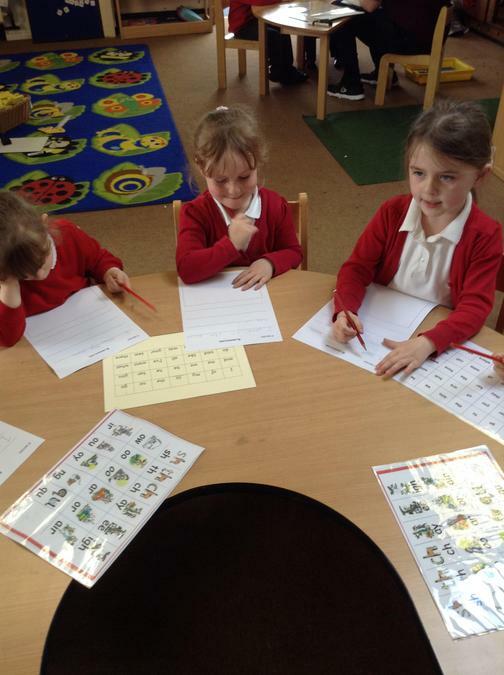 In Literacy activities we have been combining all our phonic knowledge to create our own sentences to read to each other, that give a recount of what the children have been doing, both at the weekend and during our trip out. 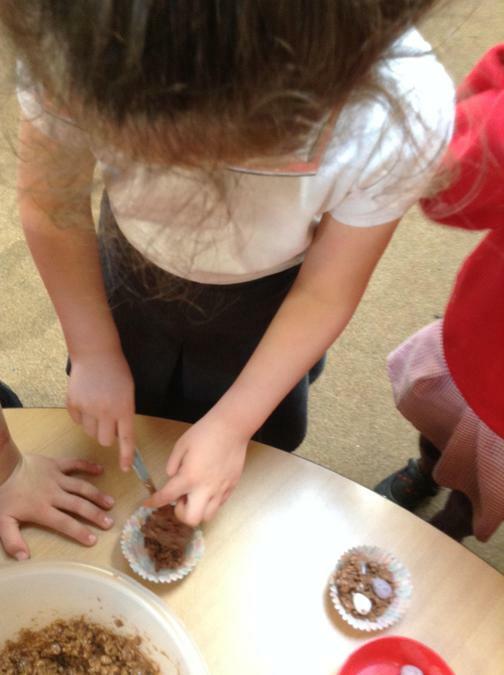 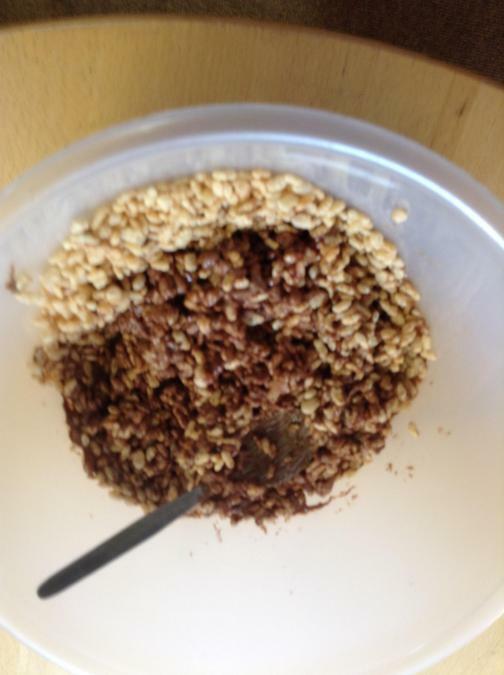 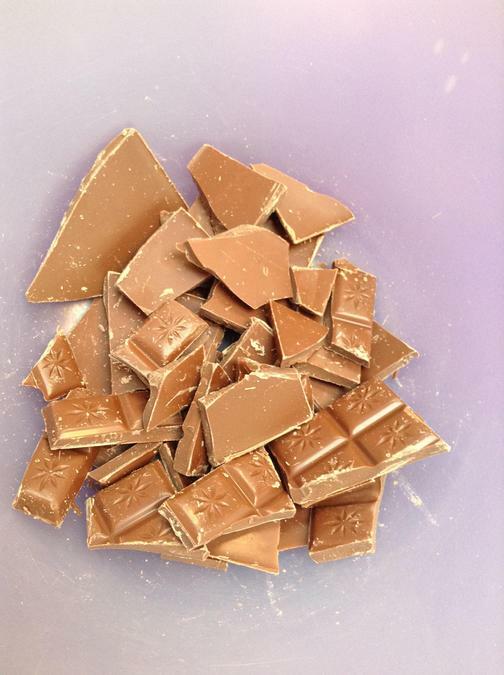 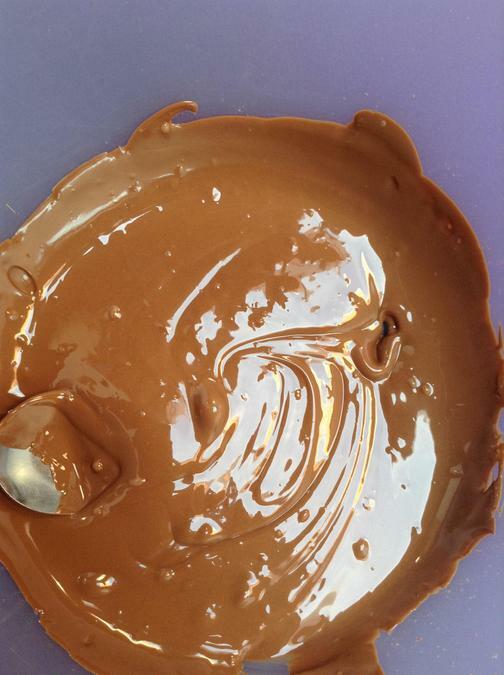 Another Easter themed, popular activity, was the cooking activity, where the children looked at the differences in solid and melted chocolate, which resulted in combining with rice crispies to make Easter nests, ready for chocolate eggs. 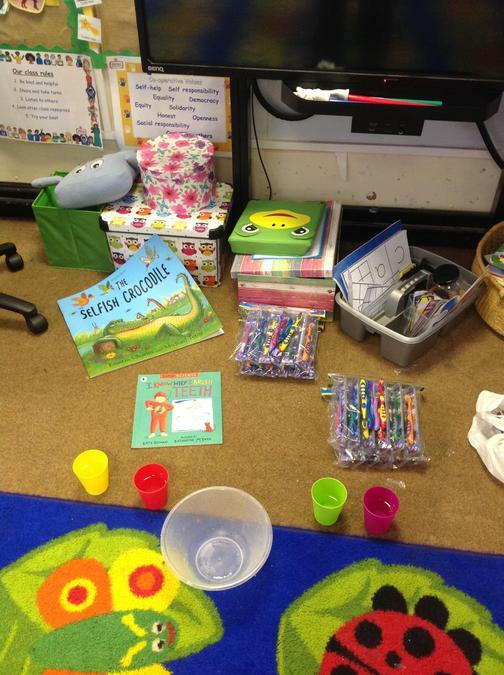 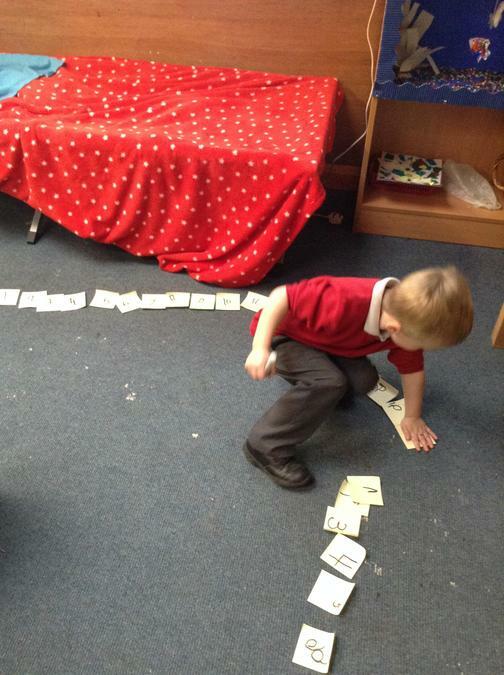 There was some good discussion about amounts and processes, and the children enjoyed the final product. 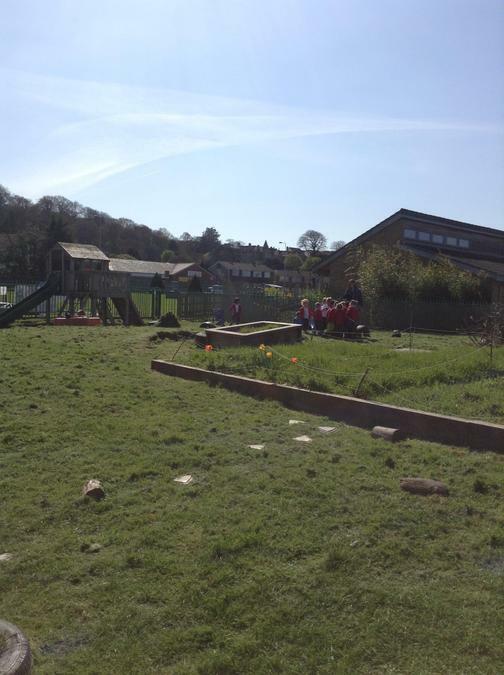 We have also enjoyed lots of sunshine this week and have made a start to dig our gardening space, ready to grow things next term. 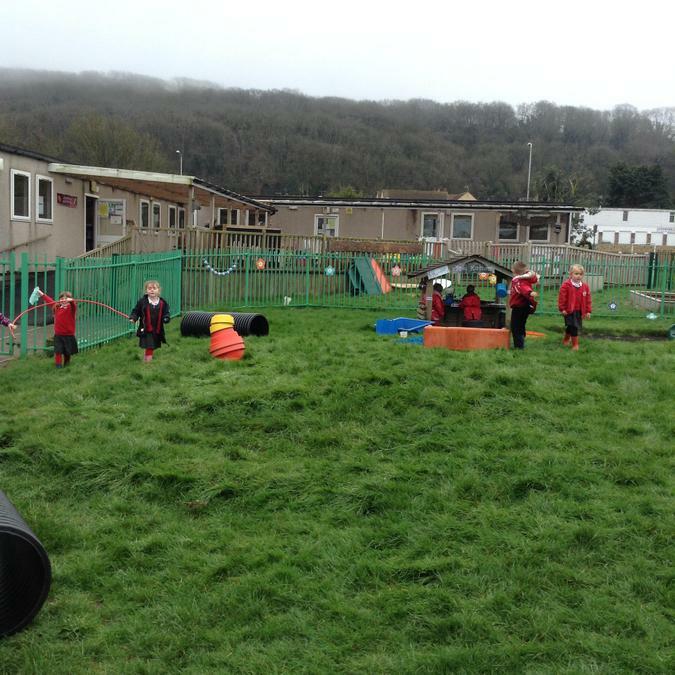 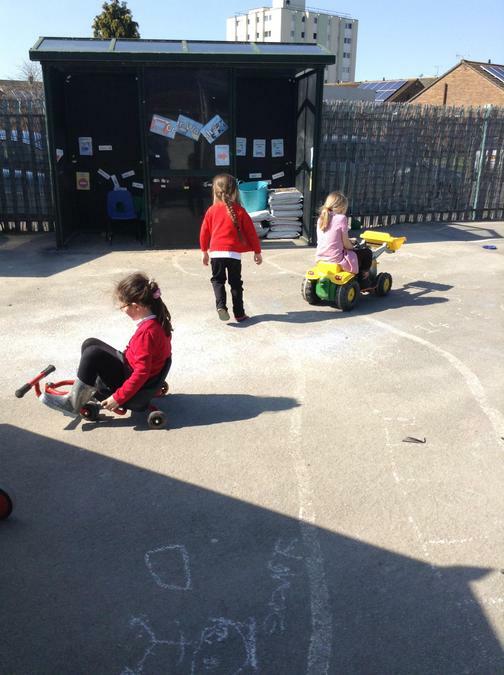 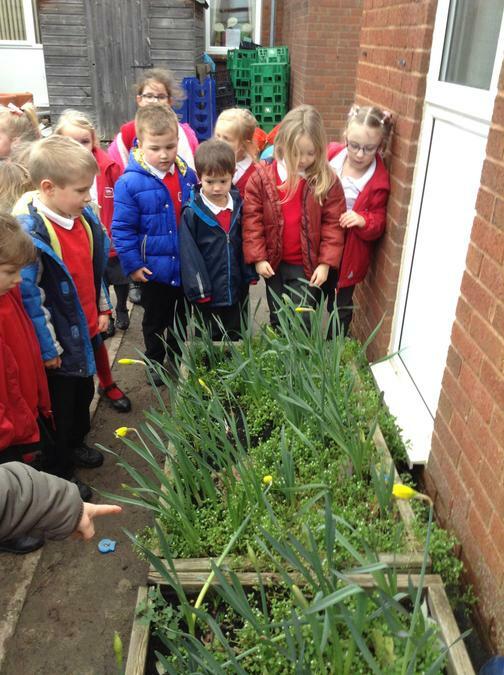 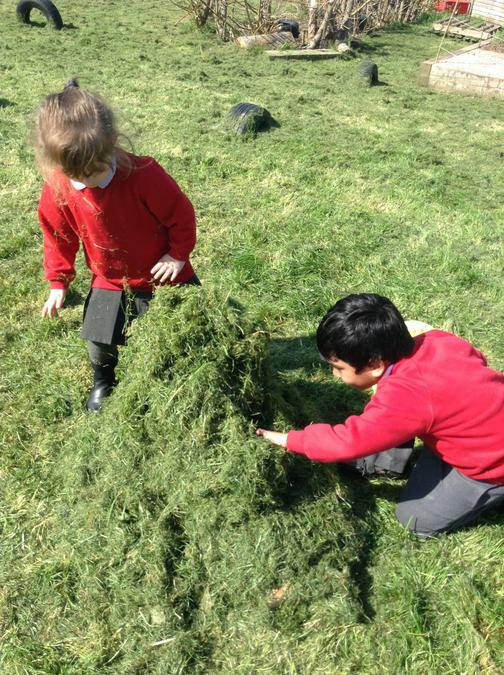 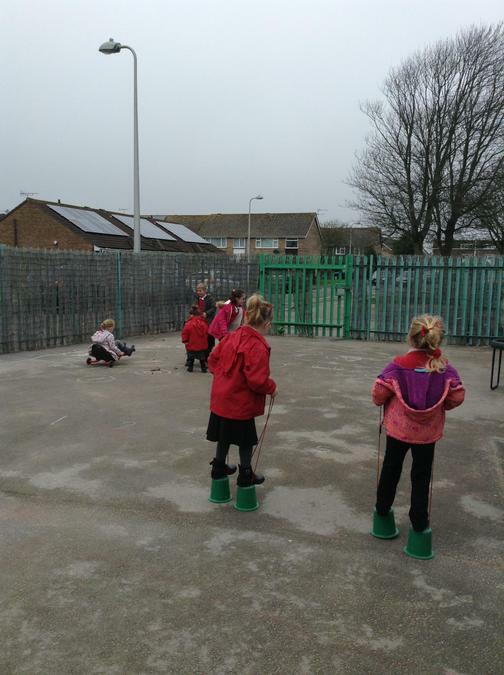 The children have been developing their team work and worked very well together to help each other both with the gardening and through their own play and exploration outside. 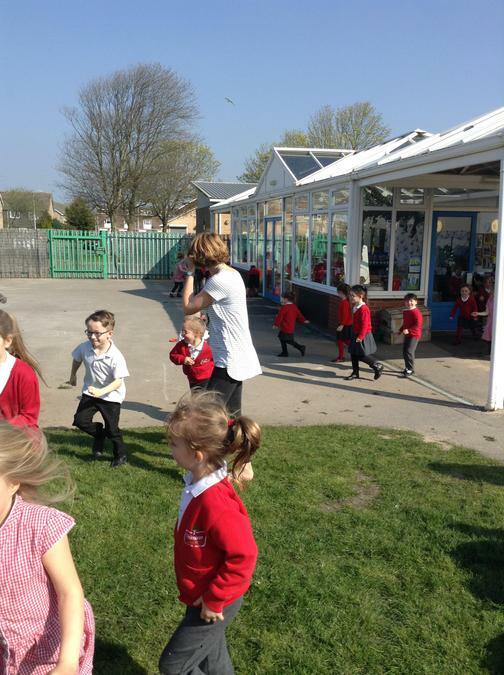 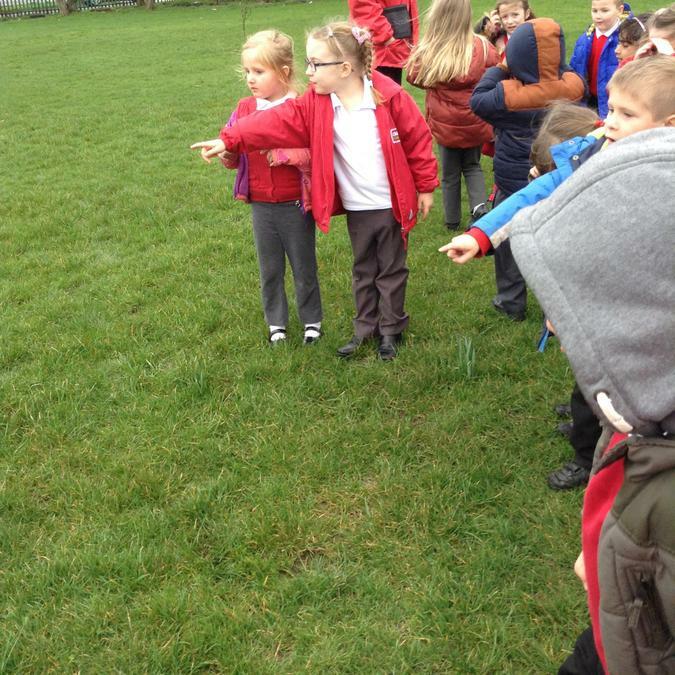 On Friday, we all completed our Easter activities with an easter egg hunt with year 1. 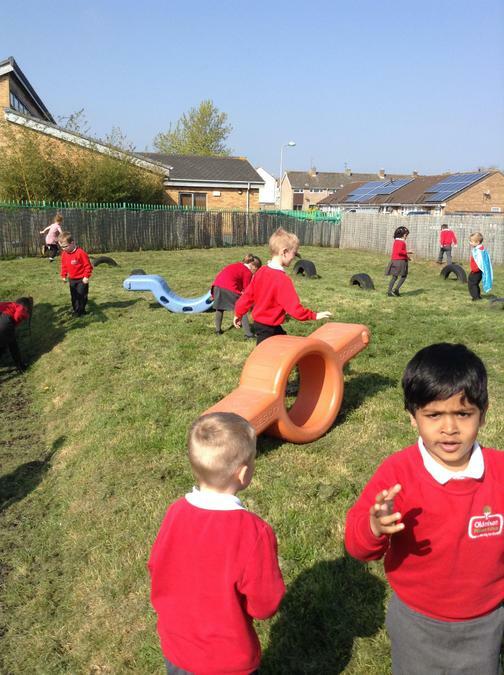 The children were very excited to go and find two eggs each and it was great to see them helping each other to find two eggs each. 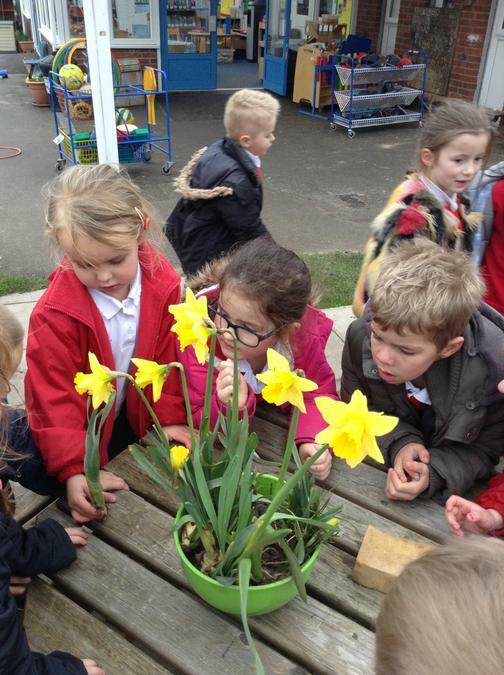 We are all looking forward to a lovely Easter and returning to school for our next learning adventures. 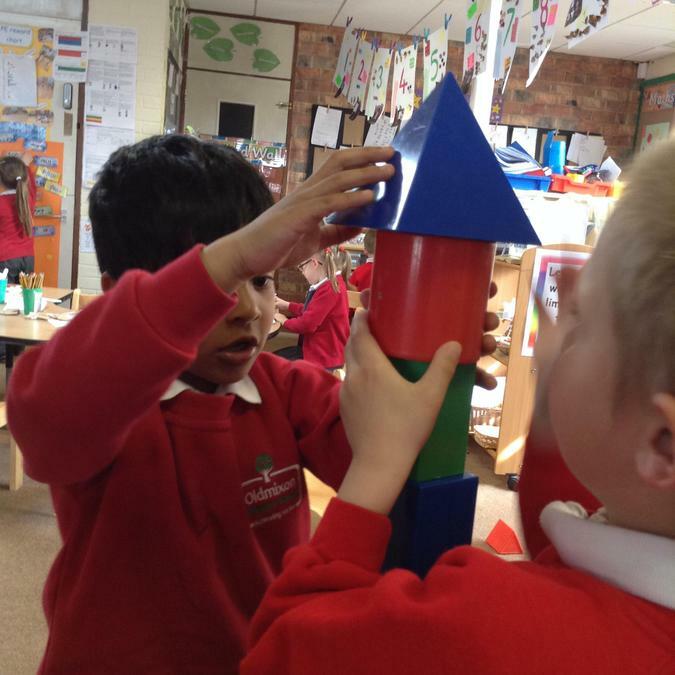 This week Reception Class has been exploring 2d & 3d shapes and the way we can use mathematical and everyday language to describe their properties. 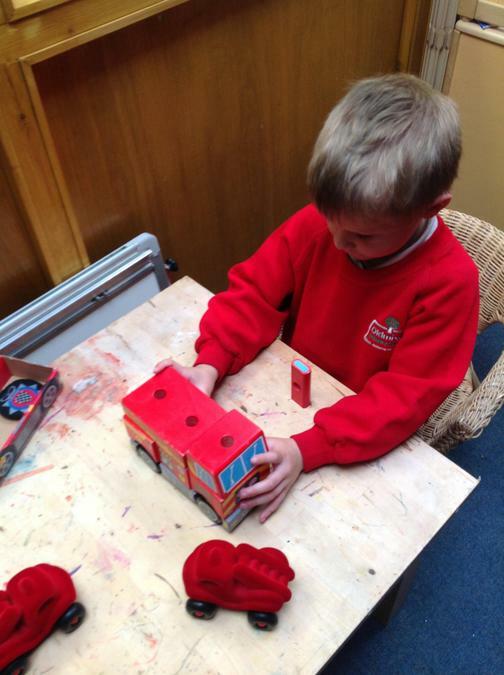 There have been lots of towers and castles built using the shapes and there has also been a lot of fun playing 'guess my shape' using the feely bags to hide and guess the shapes in there. 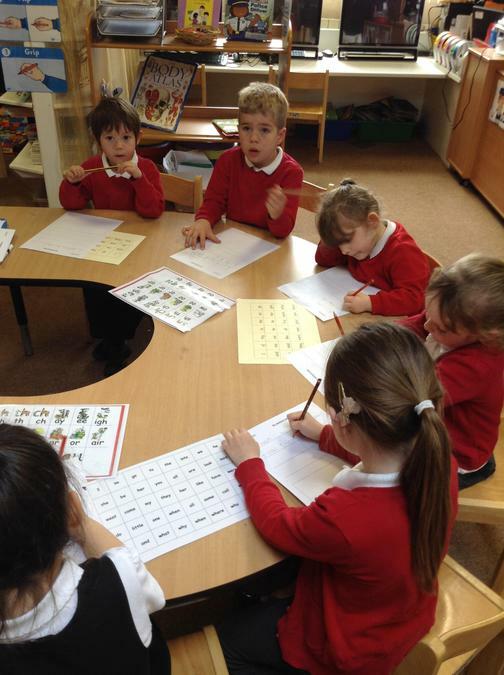 In Literacy, we have been concentrating upon using phonics to sound out, read and write words to create sentences and captions to describe pictures. 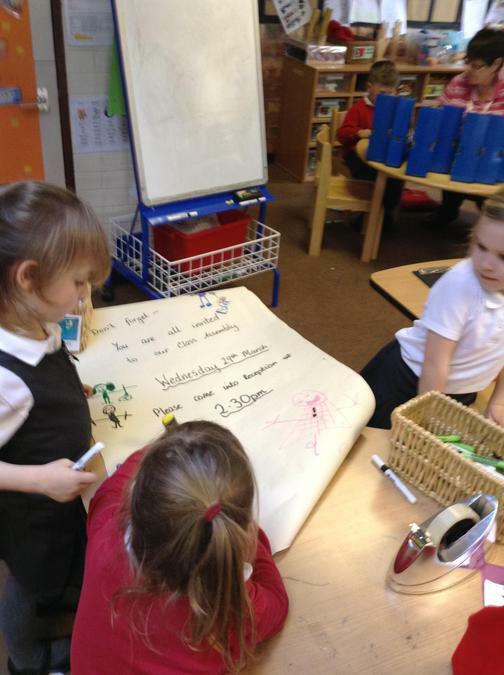 We also worked to gather to make a poster to remind everyone about our class assembly. 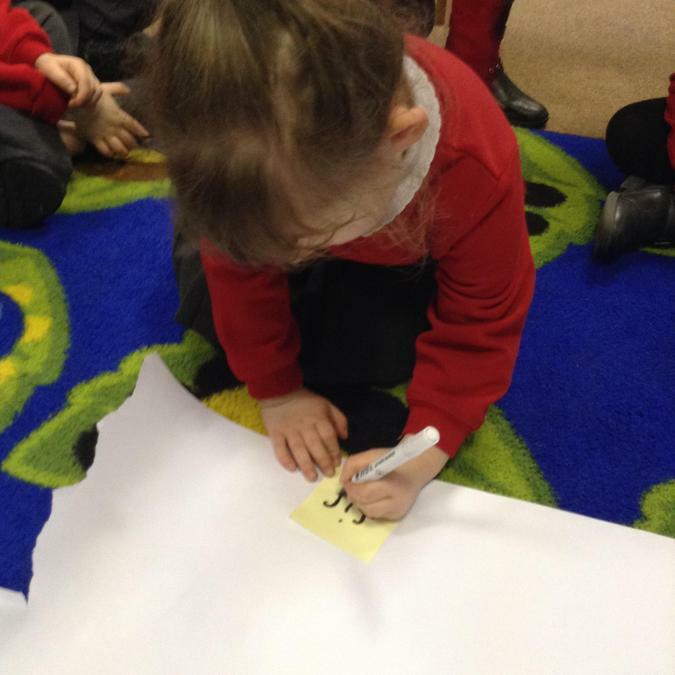 We have also enjoyed creating our own word games, which included 'Splat the word' when words were written down on large paper and then someone had to say a word and the children with a 'hand' needed to 'splat' the word as quickly as possible. 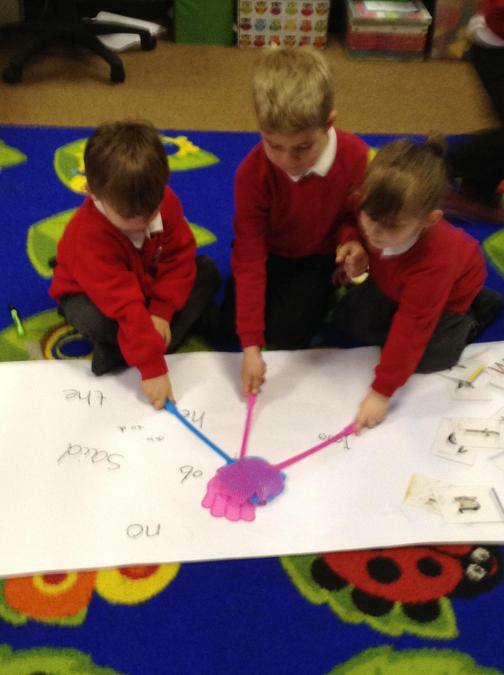 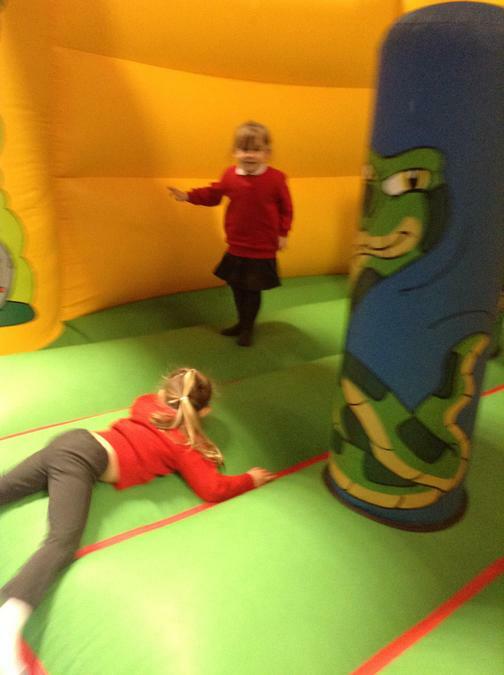 The children wrote their own words using phonics and tricky words to splat too. 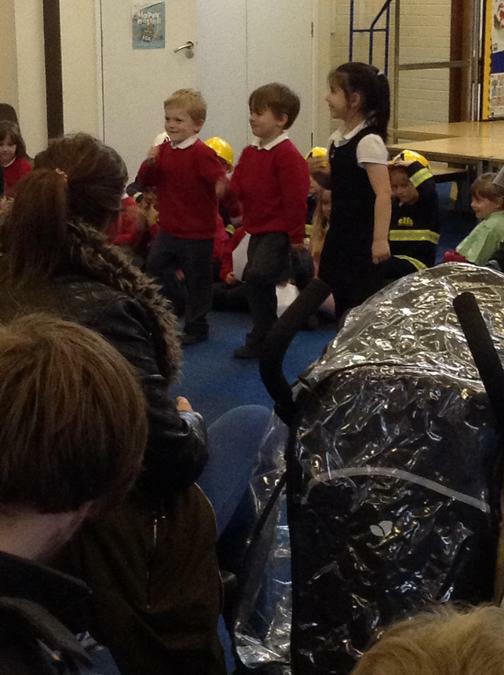 ​​​​​​​The children were fantastic, using clear vices to speak, demonstrating things they've learnt amongst a variety of skills they used to present to the audience and all learnt the class book award at the end of the week. 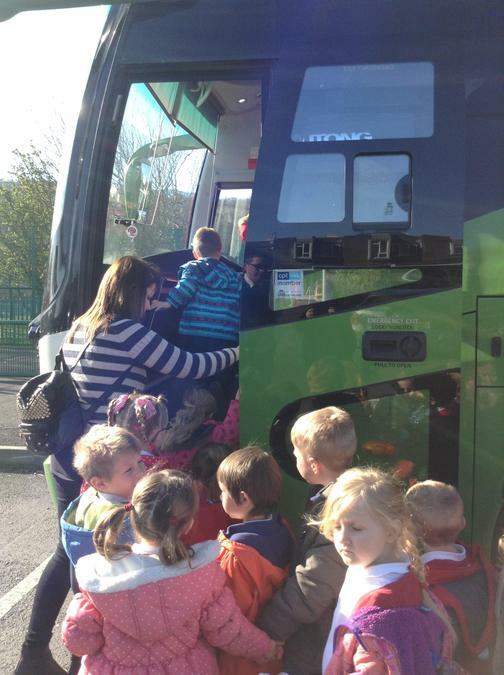 Thank you to all those who were able to come and watch the children, they really enjoyed their afternoon experience and it was great to be able to share it with you all. 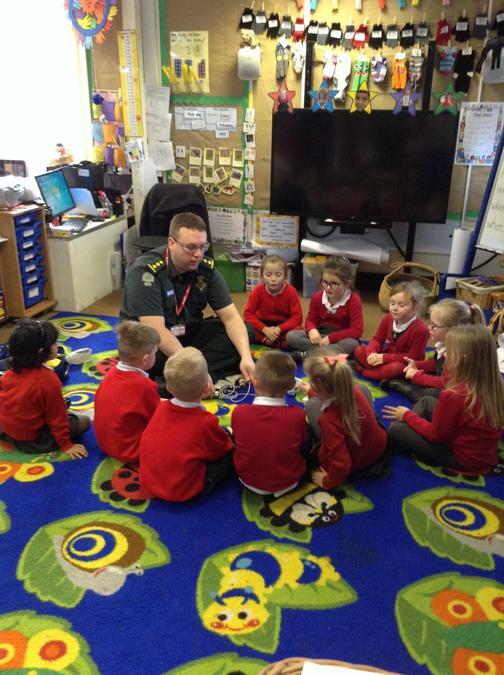 This week has been our Health Week and we have had lots of visitors to help us learn about the many ways to stay healthy. 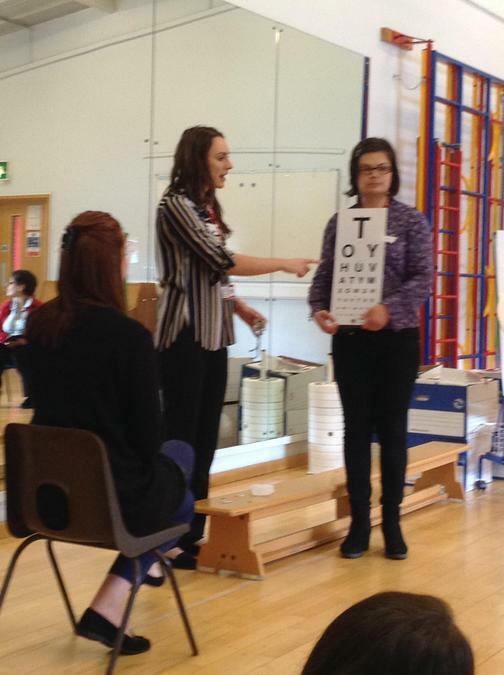 On Monday we had a visit from a local optician and we were given lots of information about our precious eyesight, including the structure of the eyes, how to exercise and rest our eye muscles to look after our eyes as well as a demonstration of how an eye test is made. 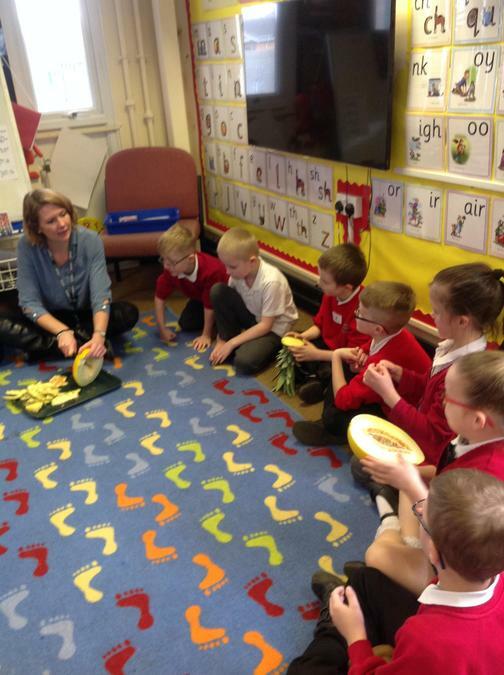 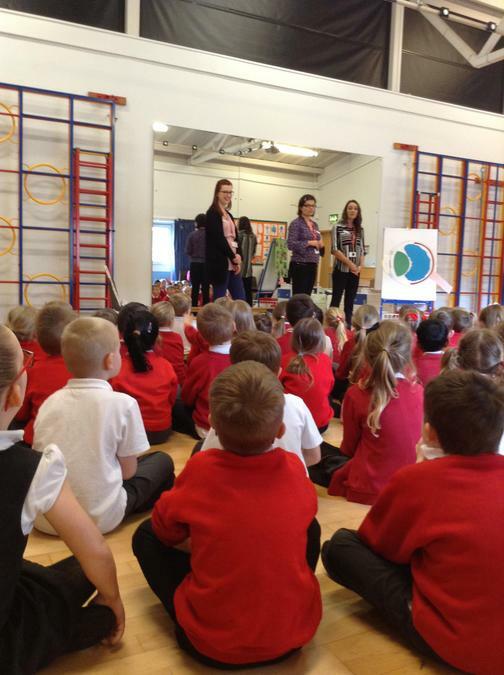 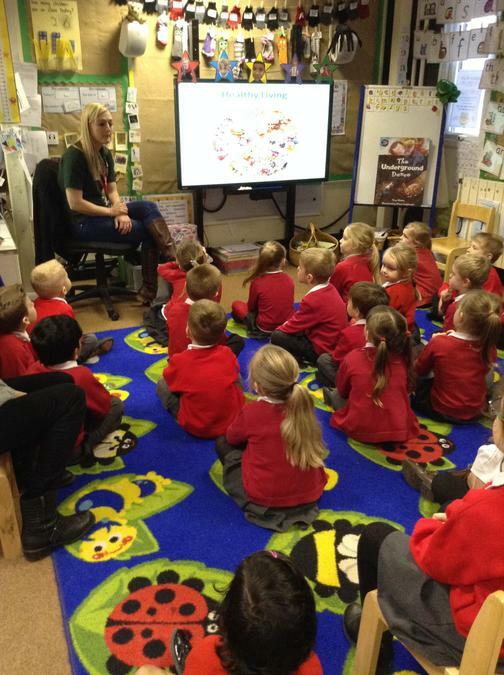 On Tuesday Meg from Farm link came to talk to us about healthy lifestyles and choices linked into the food we eat. 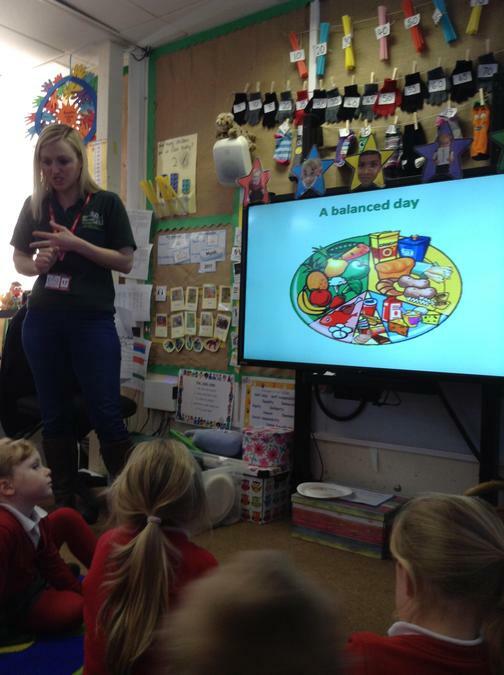 She told us about the importance of eating foods from range of food types from proteins, carbohydrates, vitamins and minerals, fibre and fats as well as the importance of drinking water. 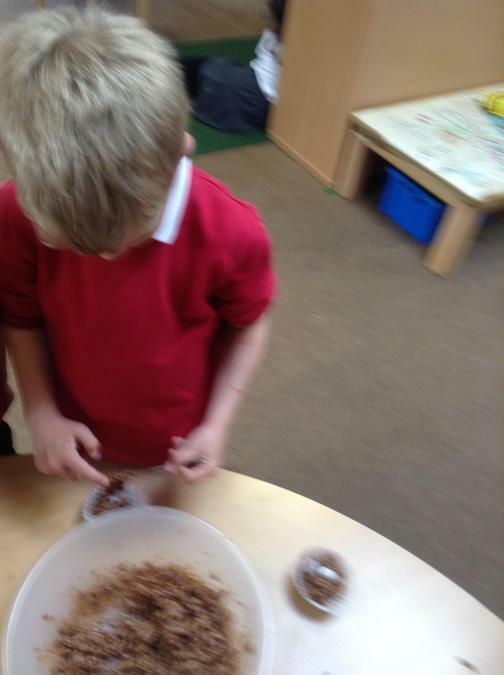 We explored ways to make healthy meals, and the difference whole grain foods - by milling some wheat and showing the white flour and all the wholemeal left in the sieve. 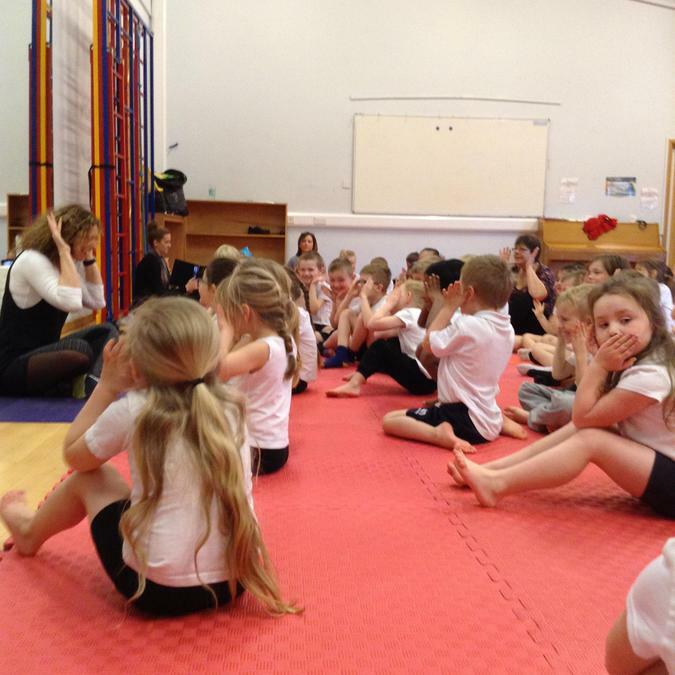 On the Wednesday, we had a whole school experience of Yoga. 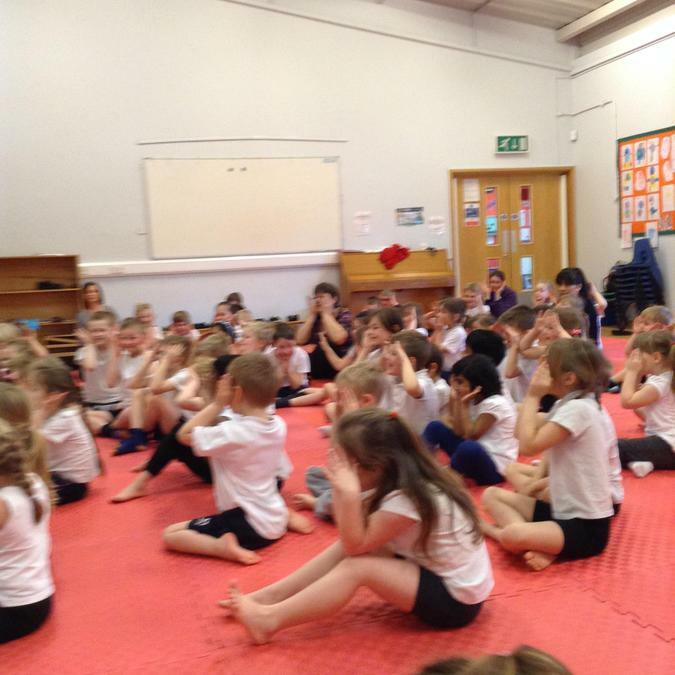 The children got changed and were taught by a Yoga instructor about the importance of breathing, body posture and balance. 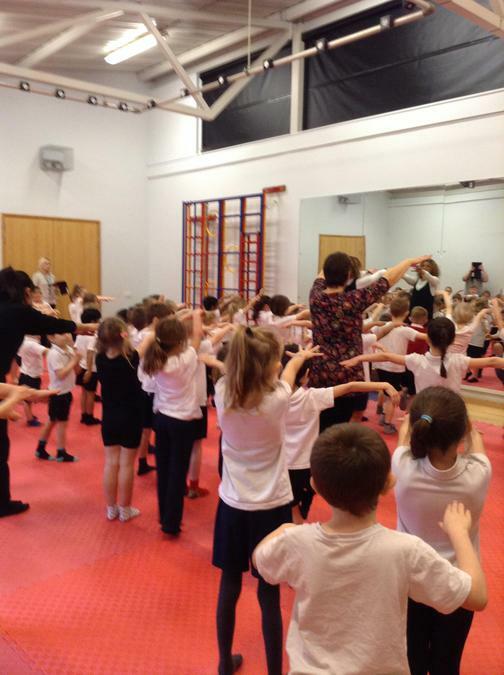 She demonstrated many ways we can stretch and focus our bodies and led very enjoyable sessions which we hope to continue to practise and develop as it is very important to keep both our mind and body healthy and happy. 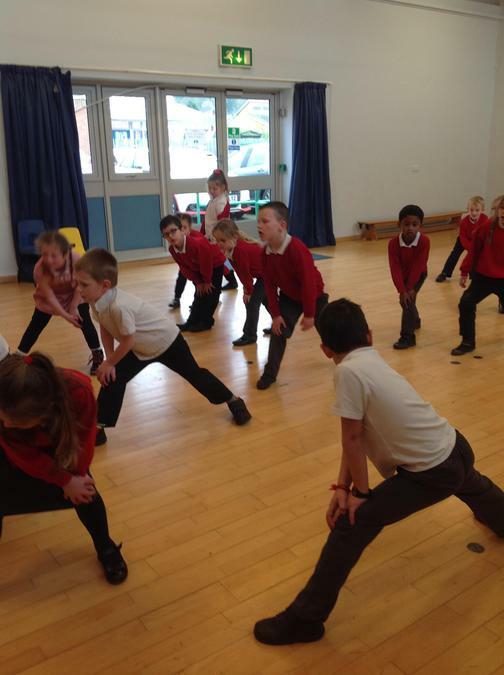 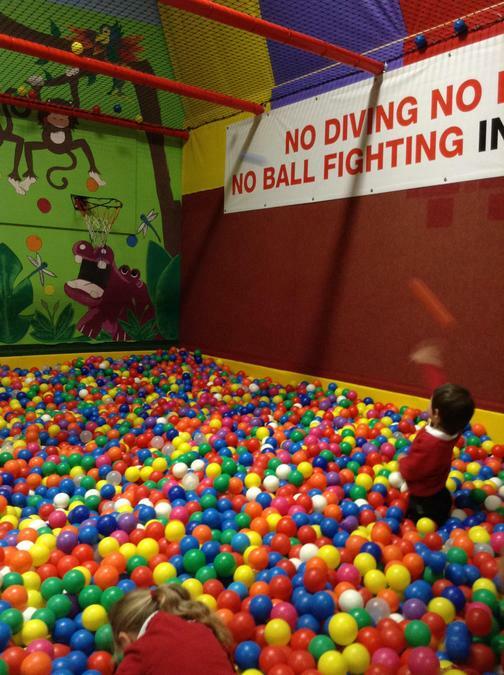 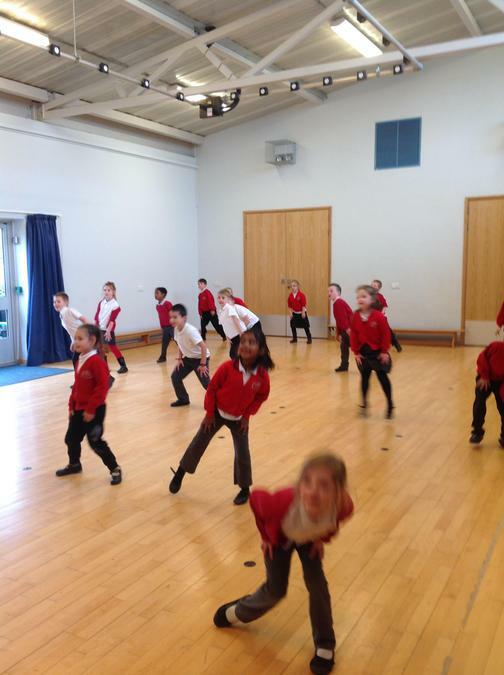 ... and having a go at an aerobic session. 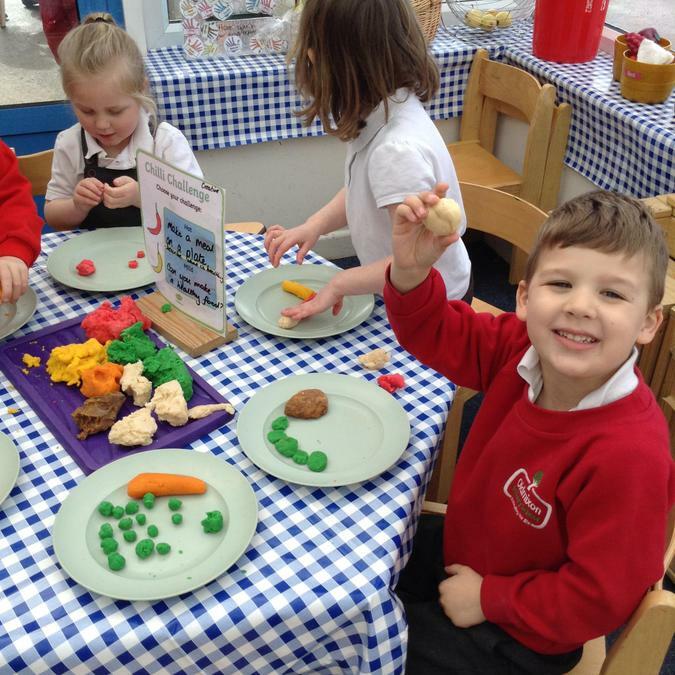 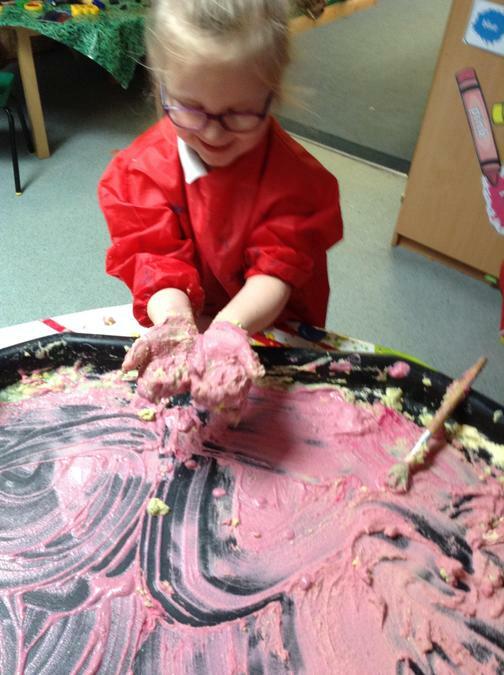 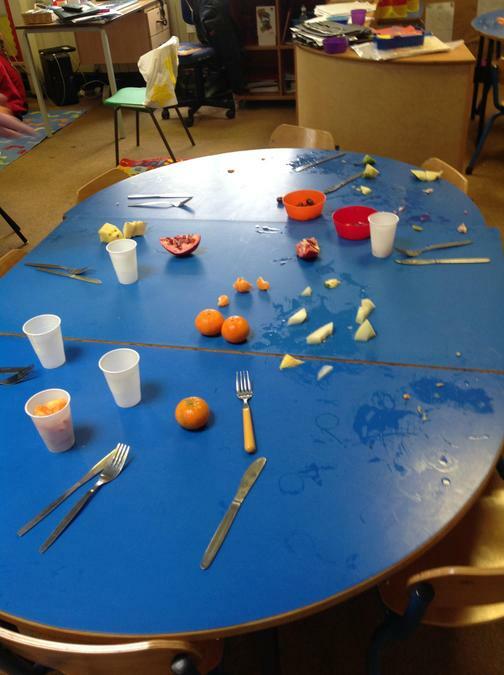 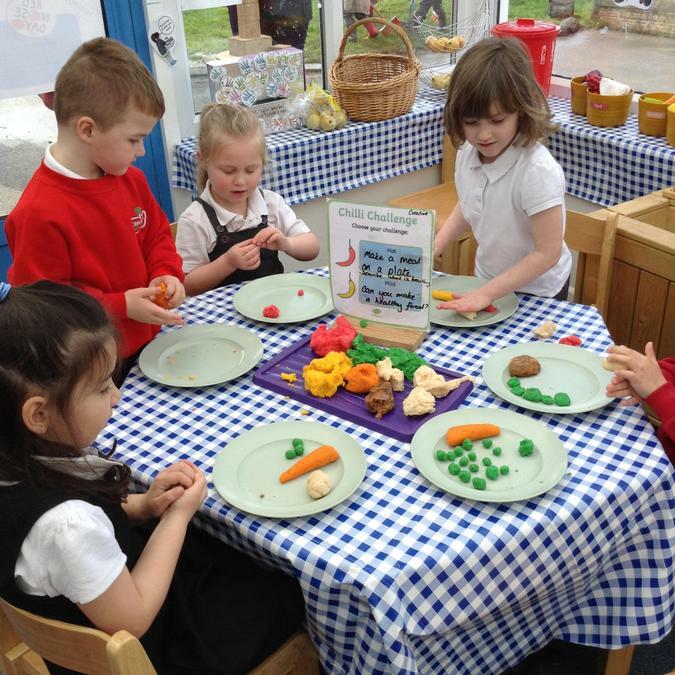 Through out the week the children have also been writing about what they have learnt, including making their own healthy menu for the role play hospital, counting and tallying the fruit and vegetable eaten in class and creating play dough healthy meals on a plate. 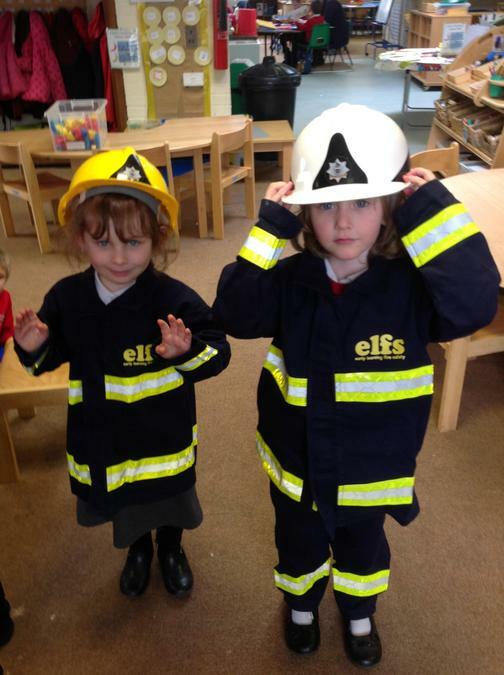 This week we have been exploring all about the fire service and have been fortunate enough to have borrowed a box of resources from the fire service to help us. 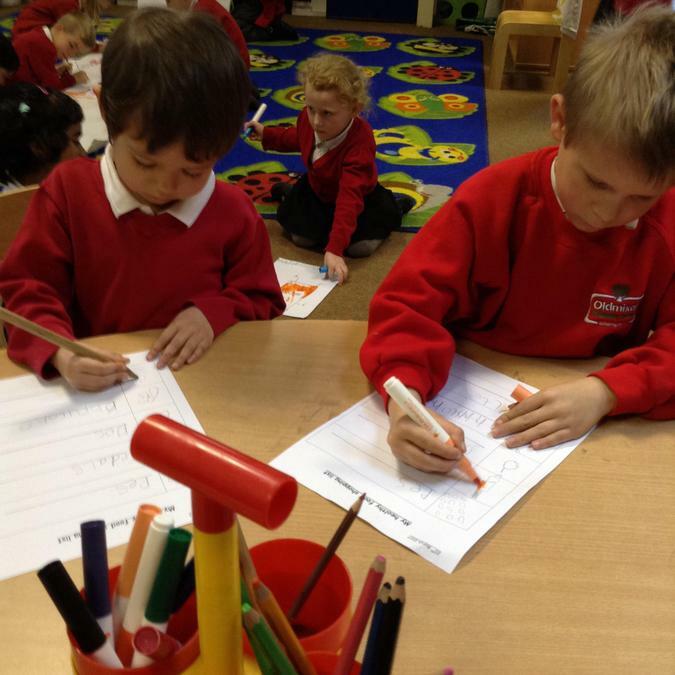 We have also been very busy writing thank you letters and note to all those who have been to visit us, singing songs about people who help us and practising all the numbers we can recognise in the environment around us. 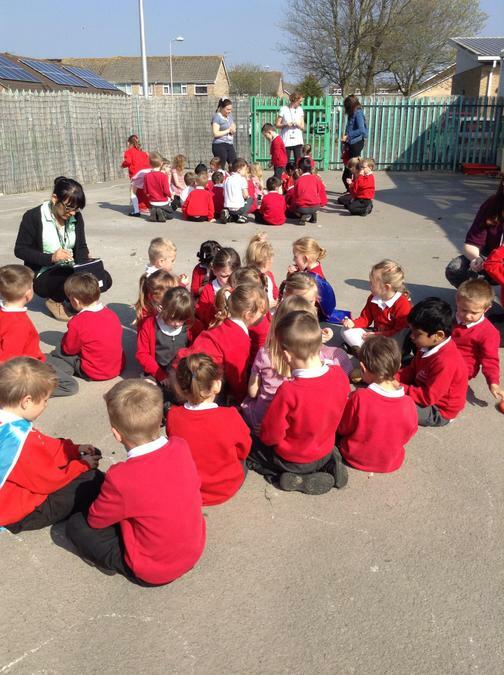 It has also been fantastic to get outside and explore in the good weather with our friends. 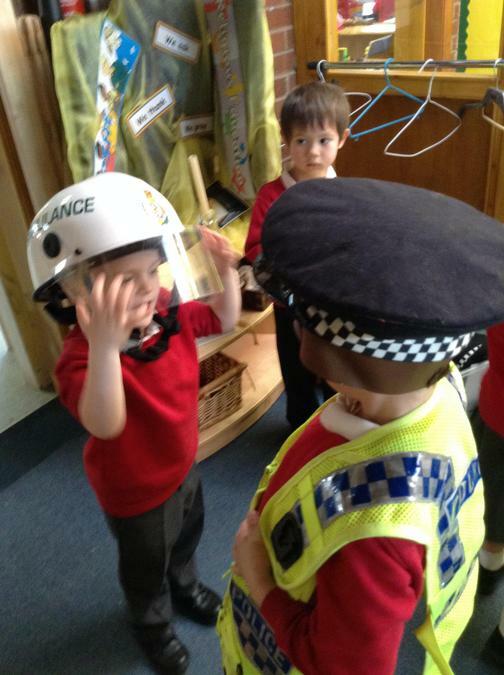 This week has been a busy one where we've had more visitors in to see us, show us their uniforms and help us learn about how they help us in our community. 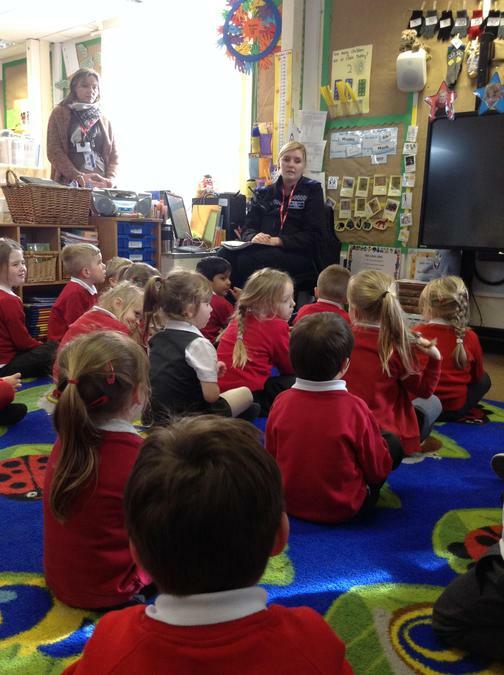 First of all we met our local PCSO and team, they came to tell us what the police force does around us and how they help people. 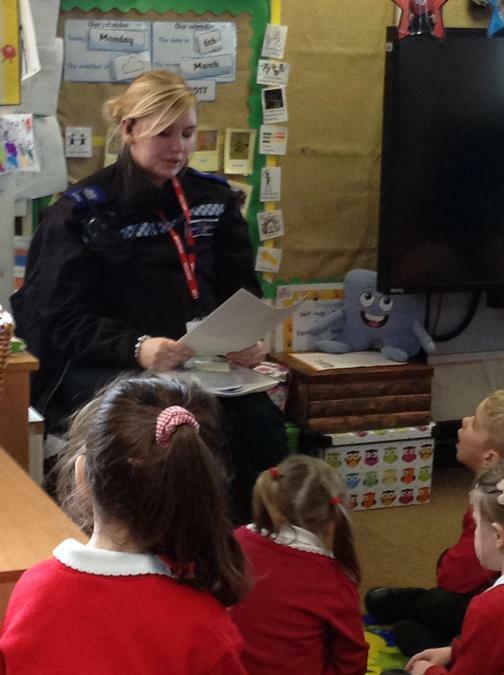 They also talked to the children about staying safe and stranger danger. 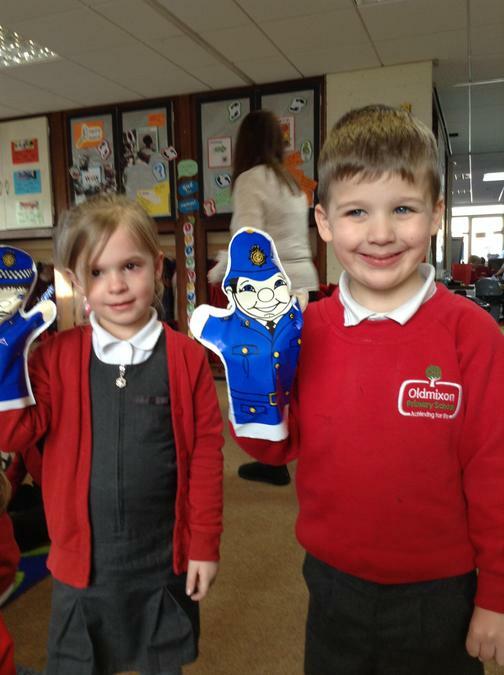 We enjoyed some games and were lucky enough to have their own puppets to take home. 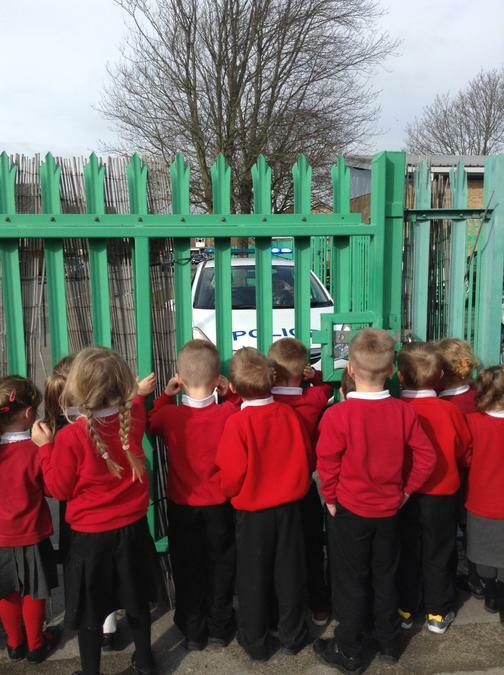 The children also really enjoyed watching the police car and seeing the blue lights. 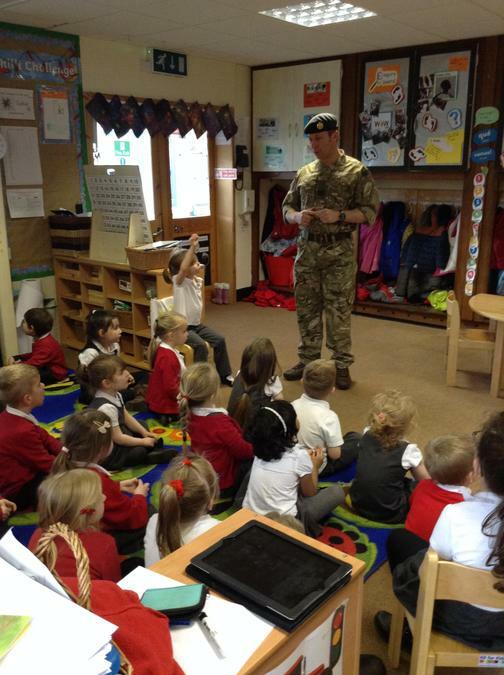 Our second visitor of the week was Sergeant Collins. 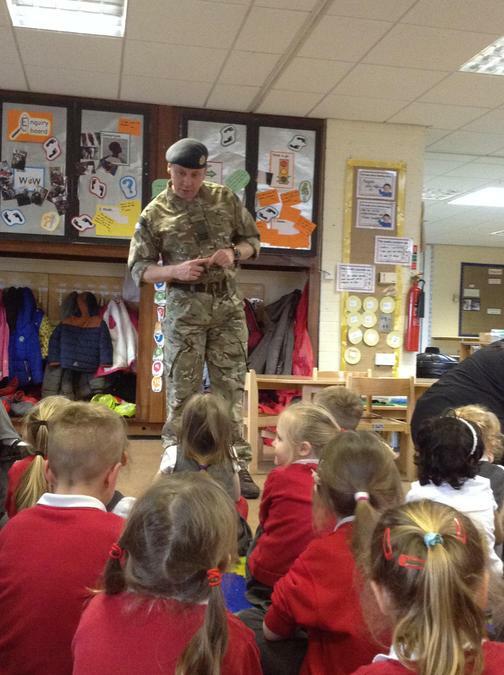 He came in his camouflage uniform and talked to us about helping to keep us safe, the importance of working together as a team and listening to instructions. 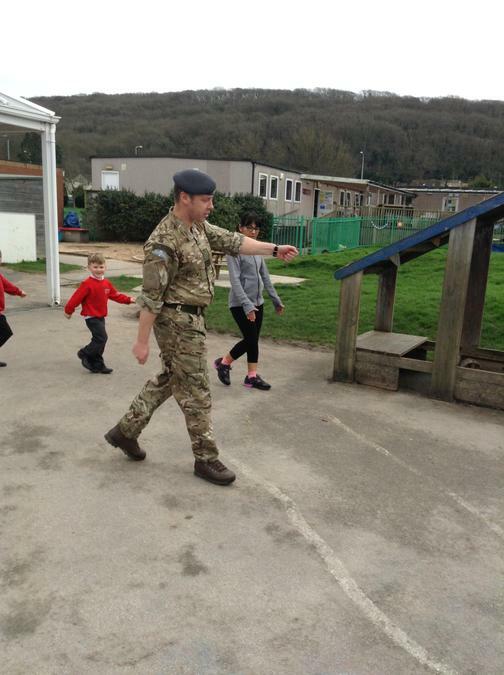 We also went out on the playground and had a go at moving together smartly and listening to the instructions to do a parade. 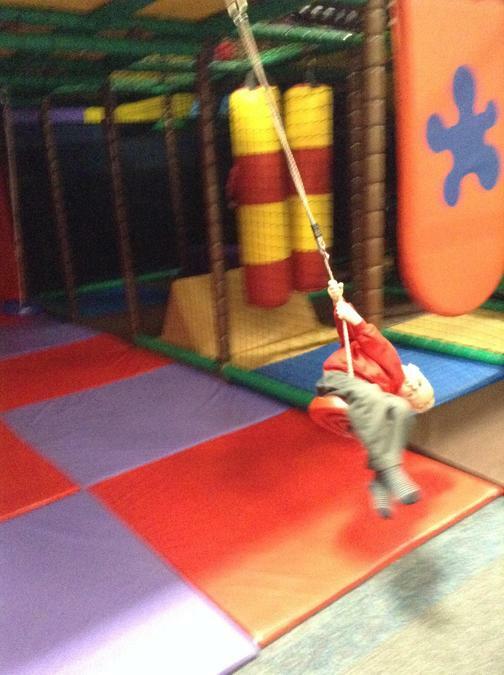 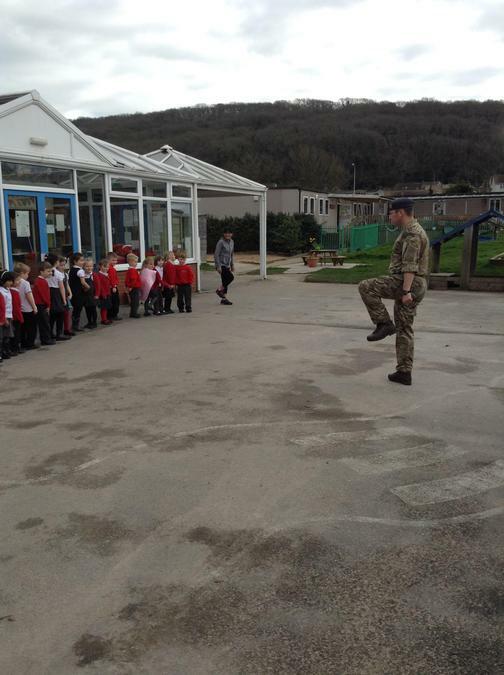 We learnt to march swinging our arms, halt, right and left turns and even a full turn! 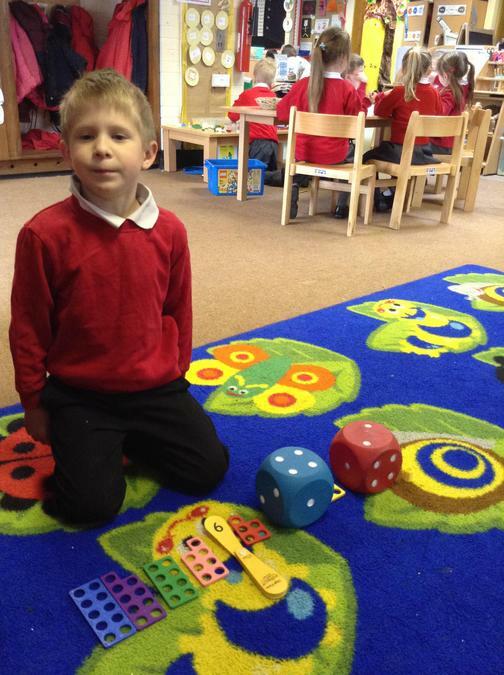 The children have also been developing their mathematical language and understanding of creating 'teen numbers' and demonstrating this visually through a variety of objects, number lines, numicon and tallies. 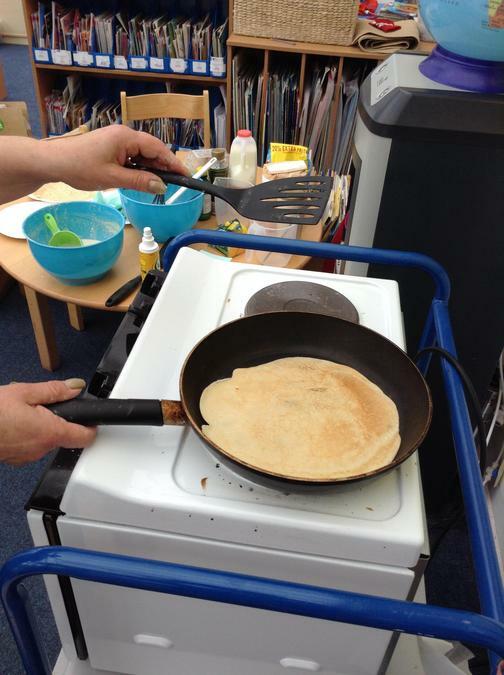 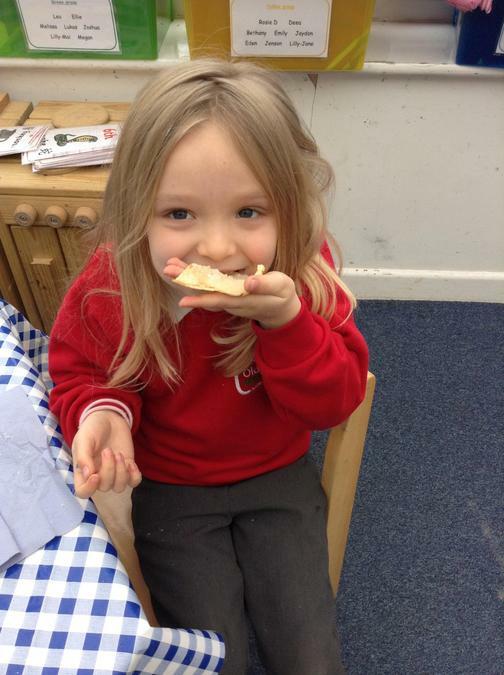 This week, we particularly enjoyed Tuesday and celebrated Pancake day and food out about its origins in Shrove Tuesday. 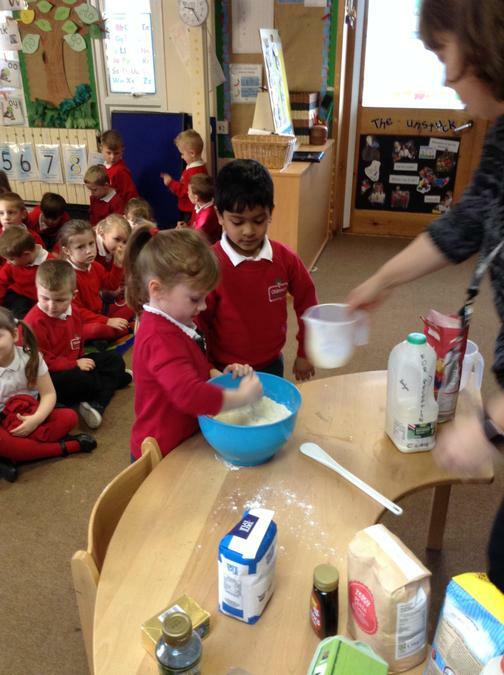 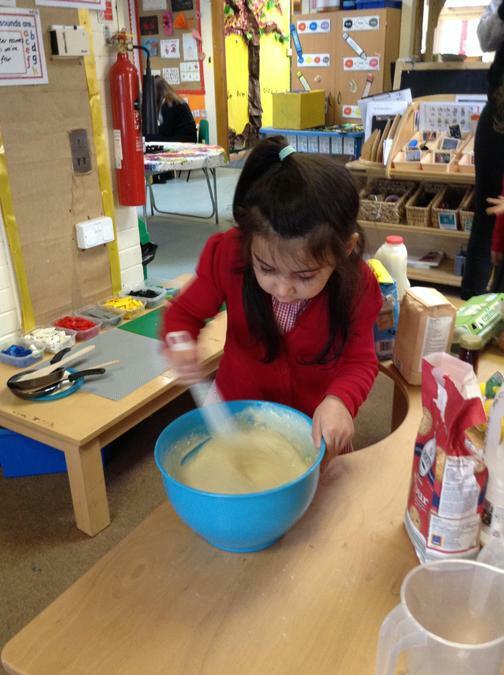 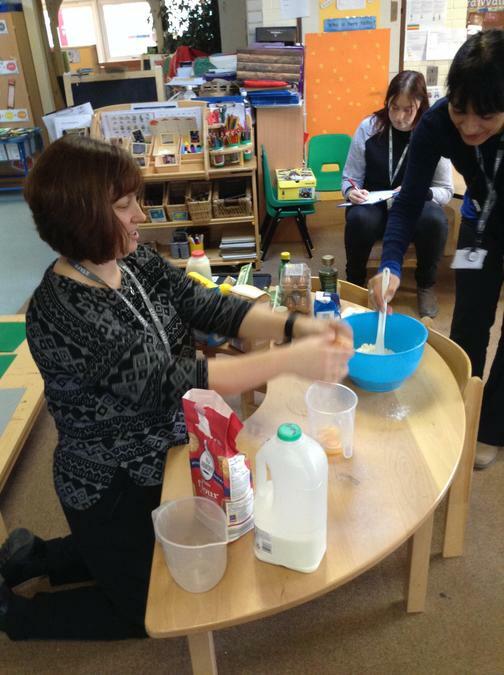 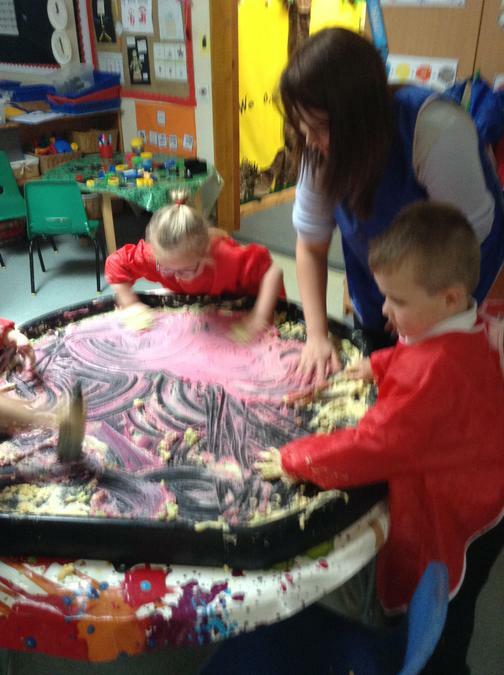 The children all helped to make the batter, everyone had a turn at stirring the mixture and then Mrs Robinson cooked everyone a pancake each. 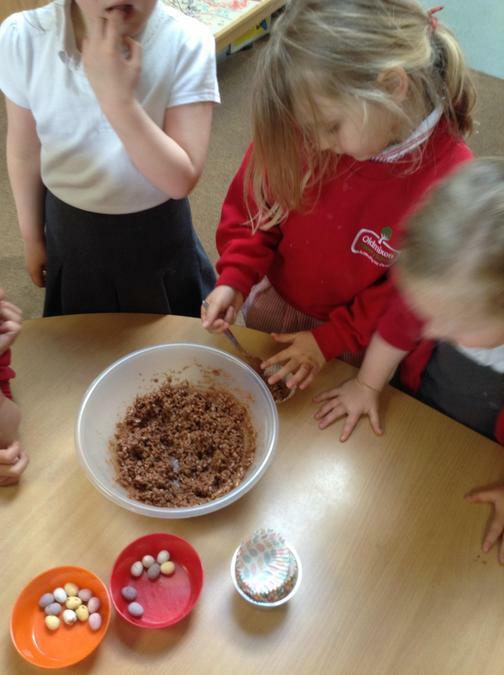 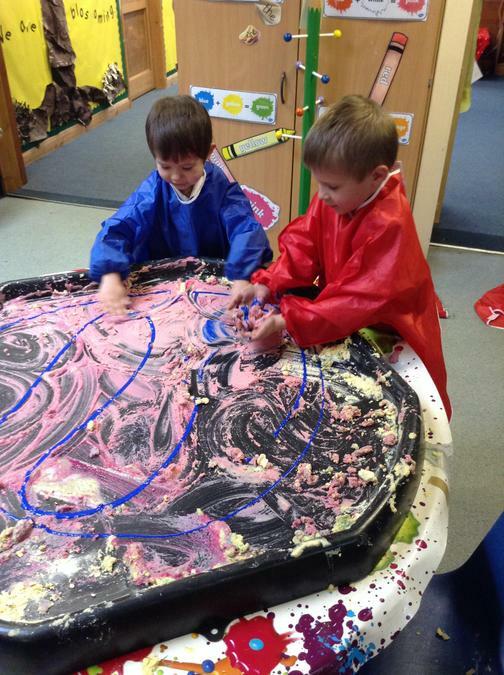 The children then put their own choice of fillings in, before rolling it up to eat. 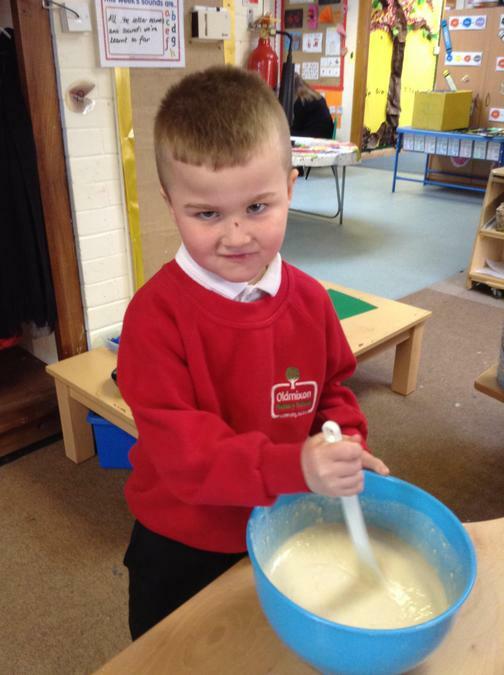 The children then ordered pictures of the pancake making process before writing their own recipes out in words and short sentences. 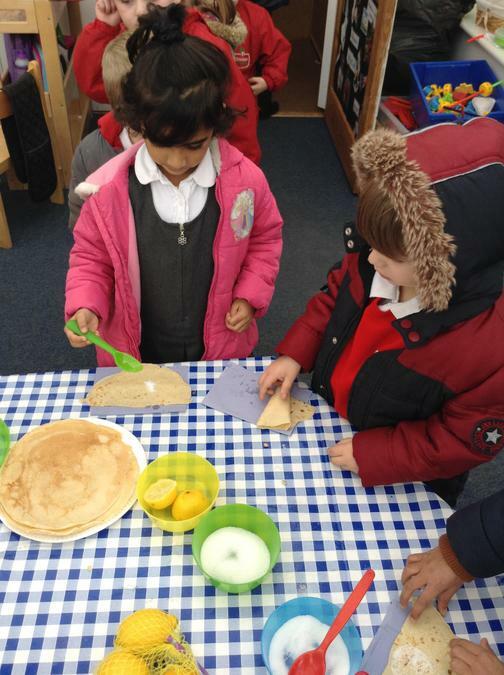 There were also lots of sight words on (paper) pancakes to flip, read and write on the 'pancake words table' complete with frying pans and spatulas. 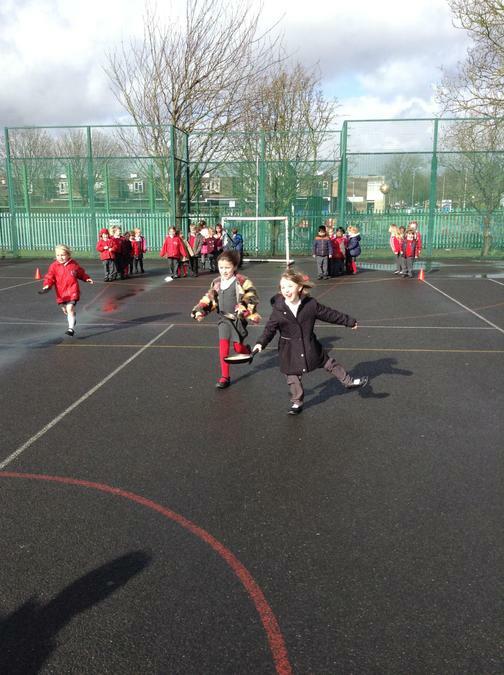 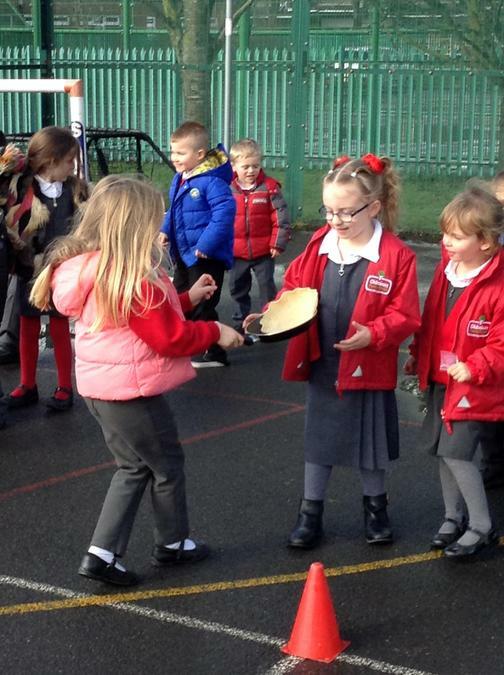 After lunch, we all went out onto the Muga and took part in our own pancake races. 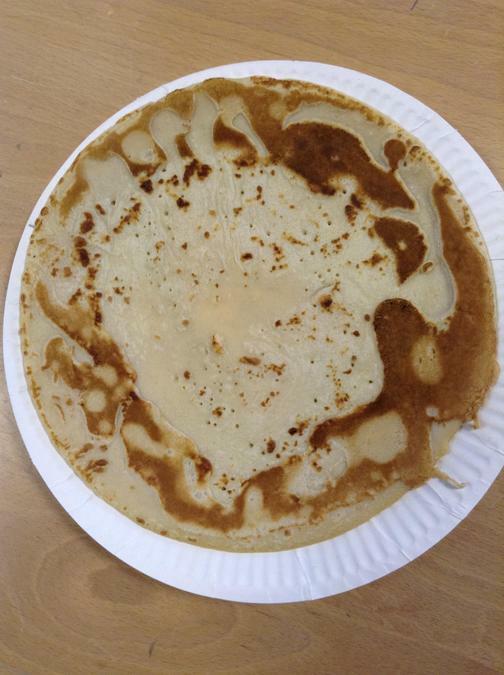 We had previously seen them on the computer when we were researching what happened in pancake day. 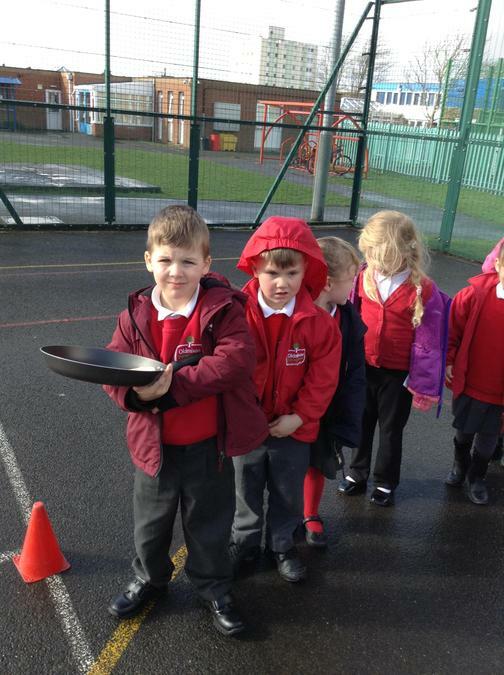 Everyone lined up on our colour groups and then took turns to flip the pancake and run along the track before flipping the pancake again at the top and then running back to change runners. 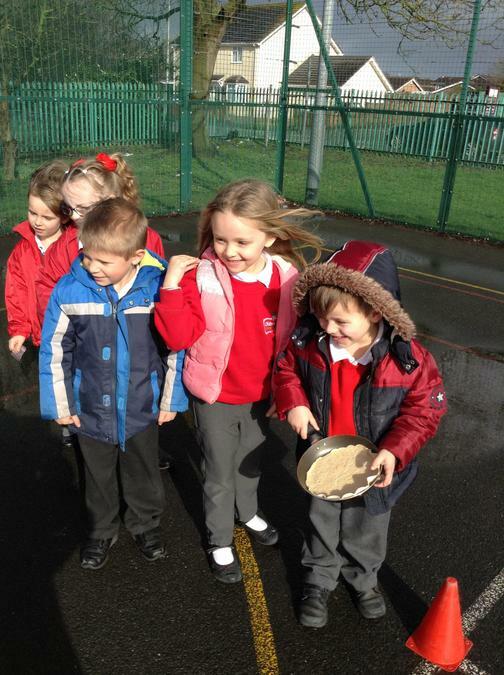 There was some very good hand eye coordination to flip and catch the pancakes back into the frying pan. 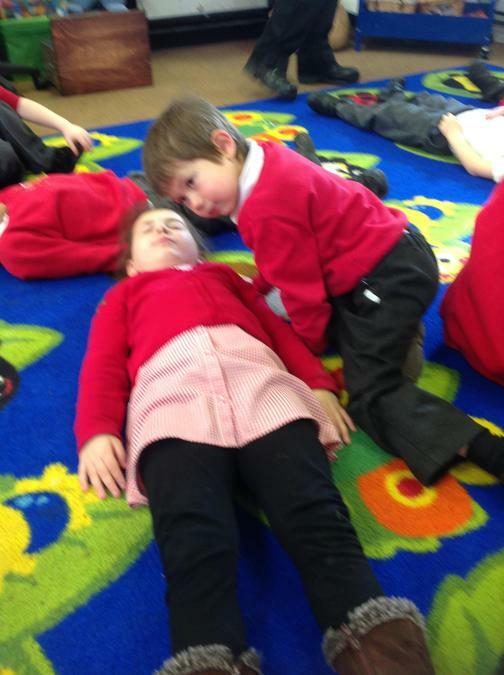 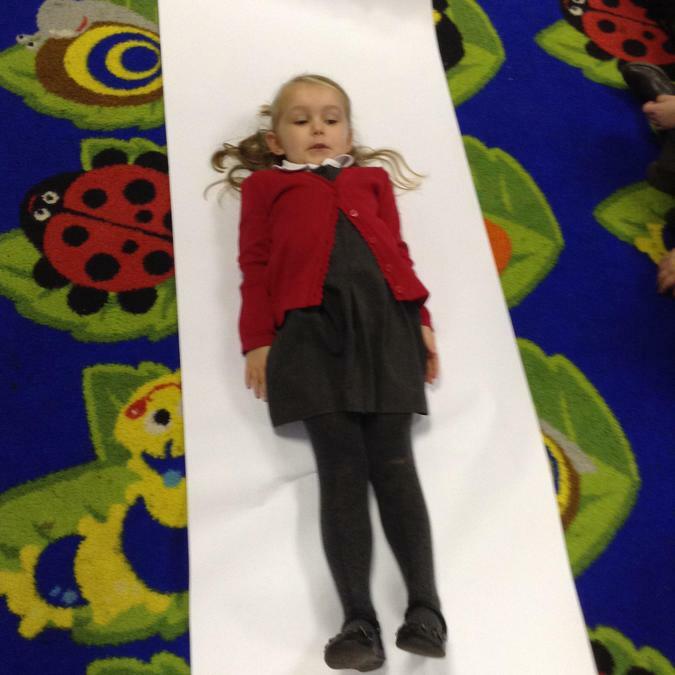 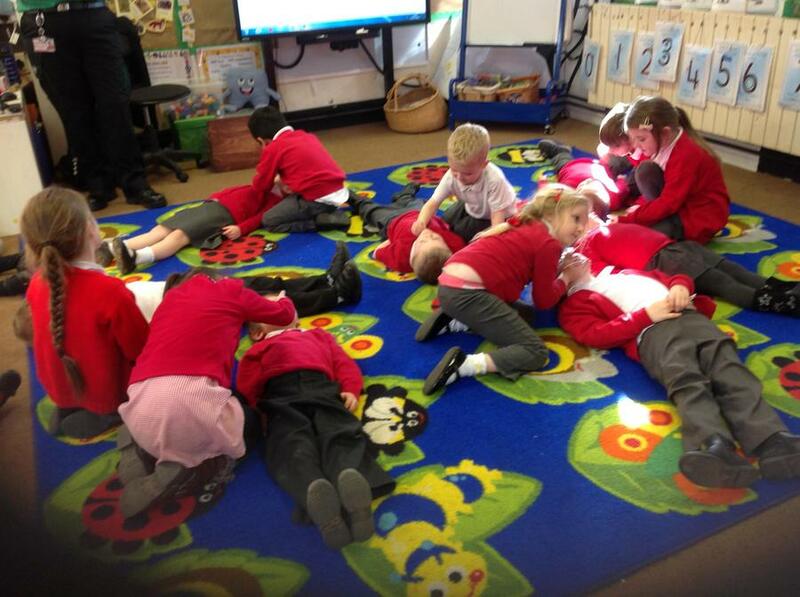 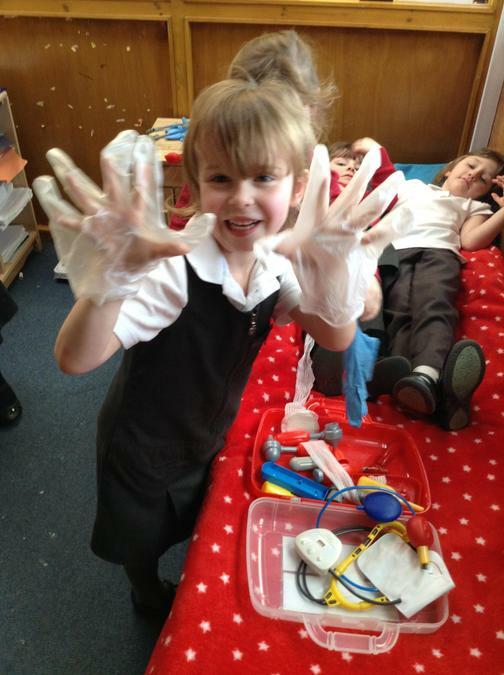 Continuing our people who help us topic, the children showed continued interest in the different parts of the body. 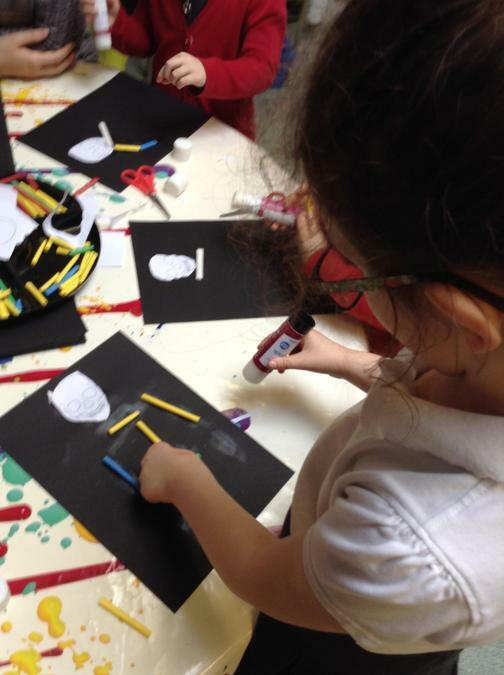 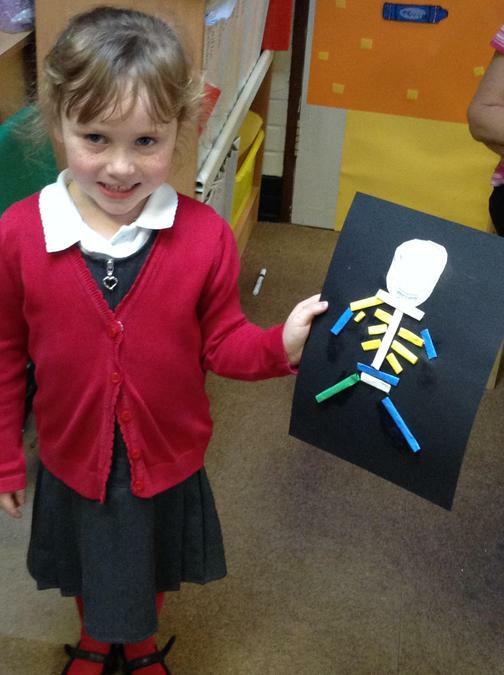 They have made their own skeletons using chalk and black paper, straws and pictures. 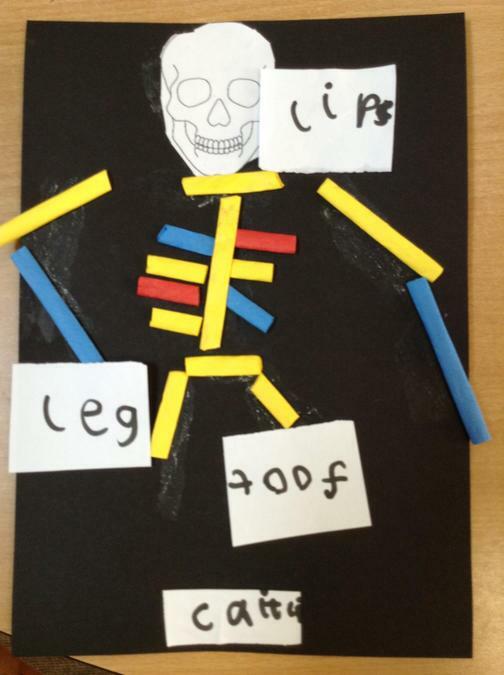 Some children then decided to challenge themselves further, by making labels for the different bones and parts of the body, using their phonic knowledge and word mats. 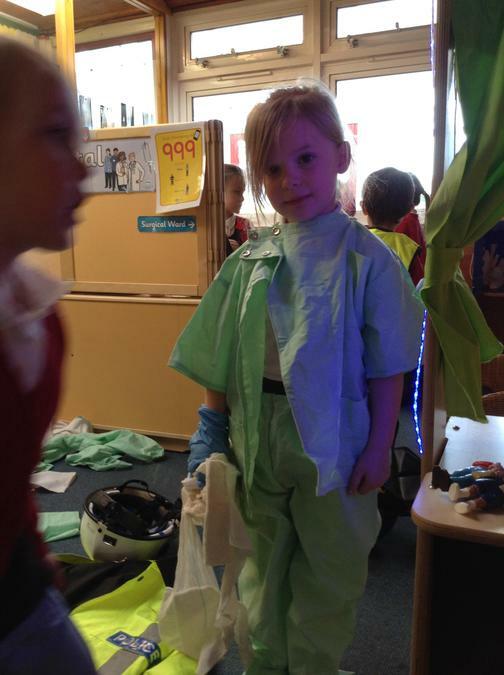 The children have also continued to develop the Role play area, with X-rays, appointment sheets to complete, emergency vehicles and the hospital area. 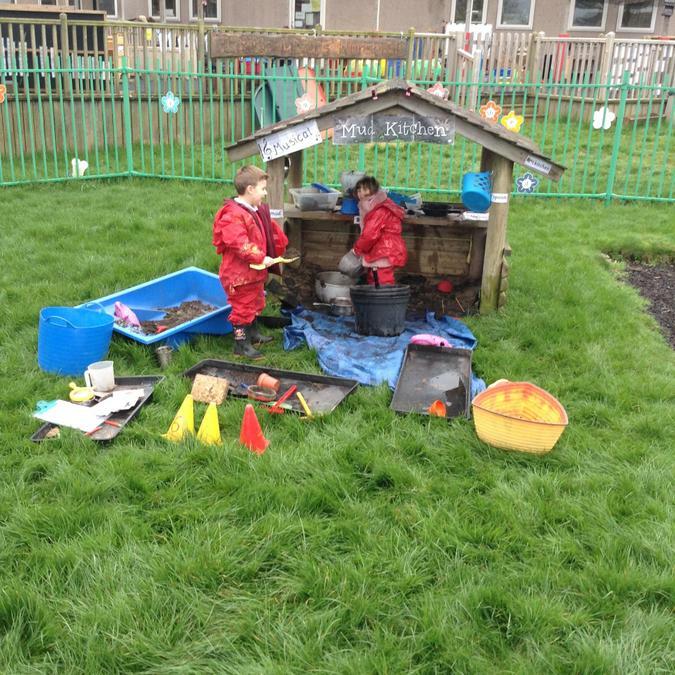 They are getting very good at their independence skills by practising them while putting on and taking off all the different role play clothes. 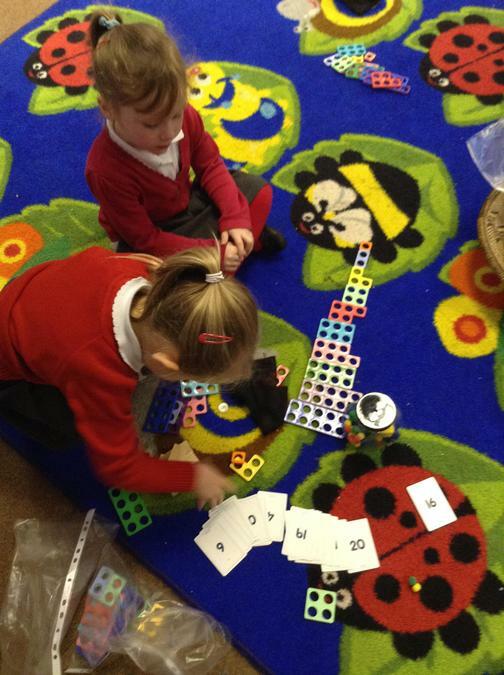 In Maths, we have been exploring the 10's frames and recognising teen numbers and the way they are made up. 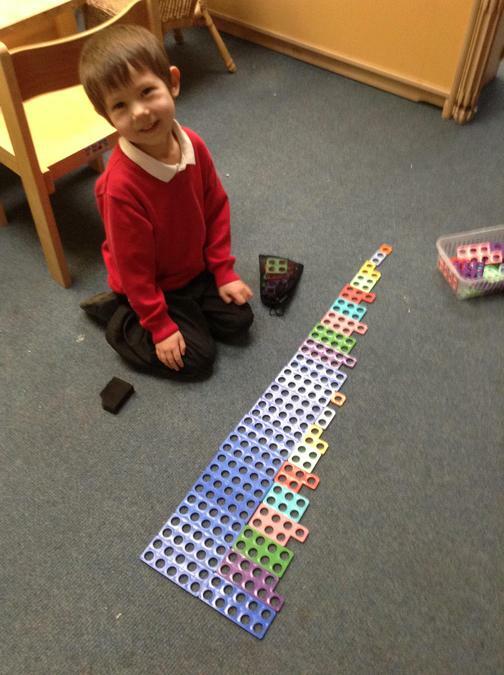 The numicon has helped to visually see the 10's and 1's / units, and straws and other objects have also helped to show how many of an object matches the numeral displayed. 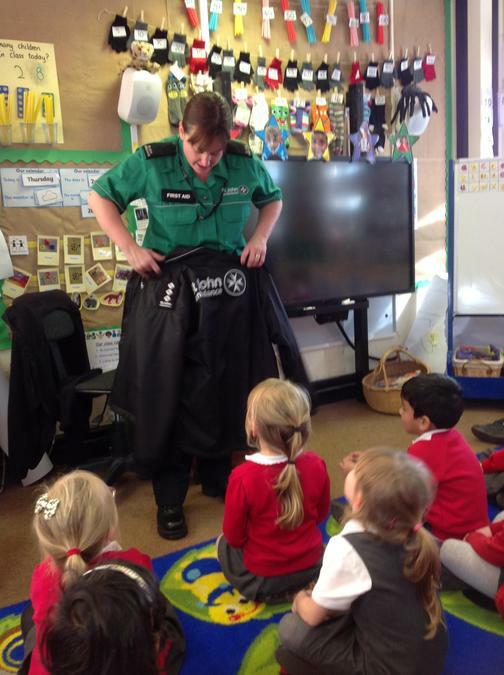 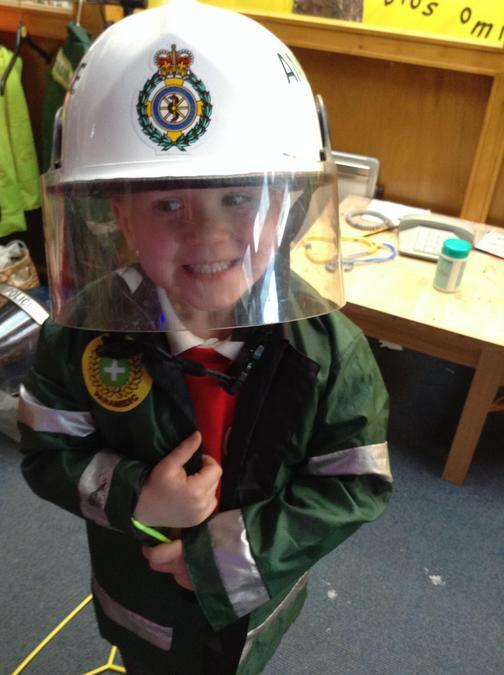 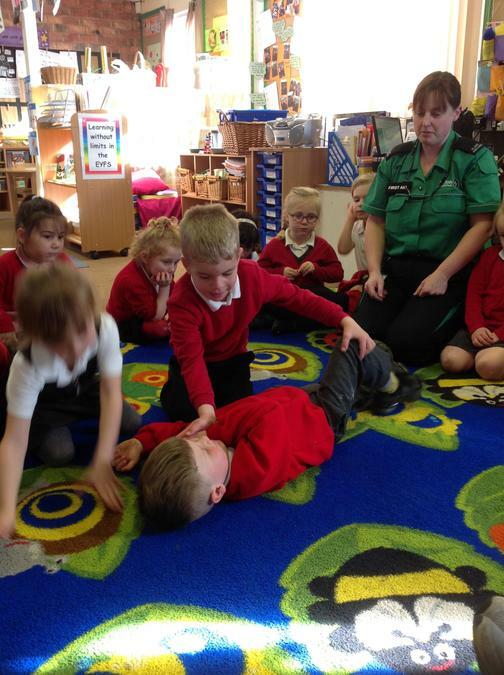 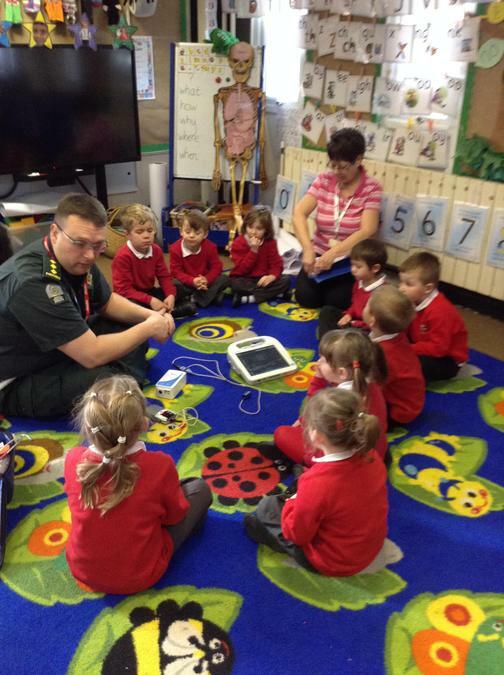 Another uniform that has visited the class this week was from St John Ambulance. 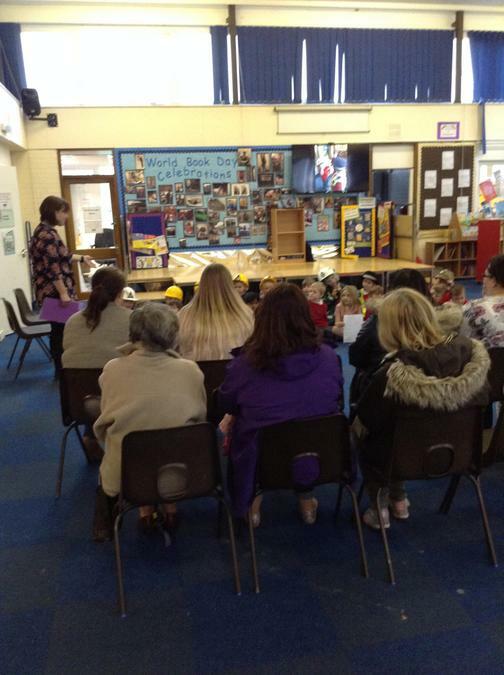 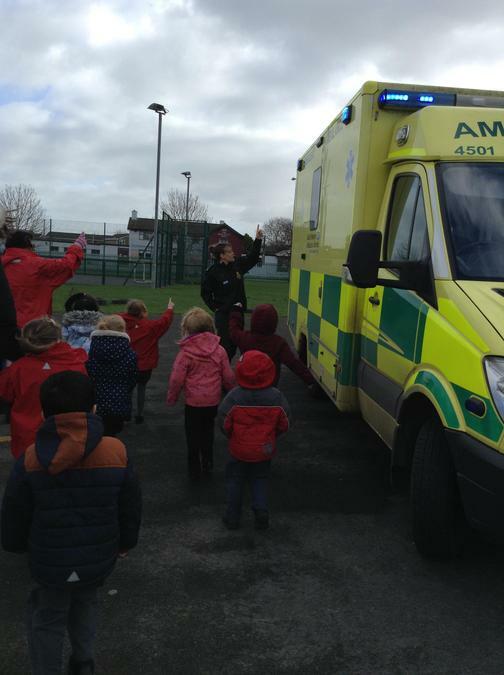 They are often seen at community events and the children got to hear about the different places they help at and what the organisation does. 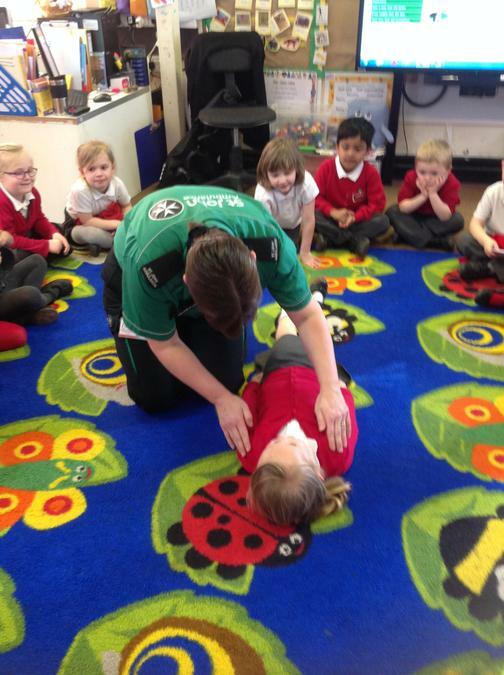 Then, the children had a practise at rolling a poorly, unresponsive person into the recovery position and then calling 999 for the ambulance. 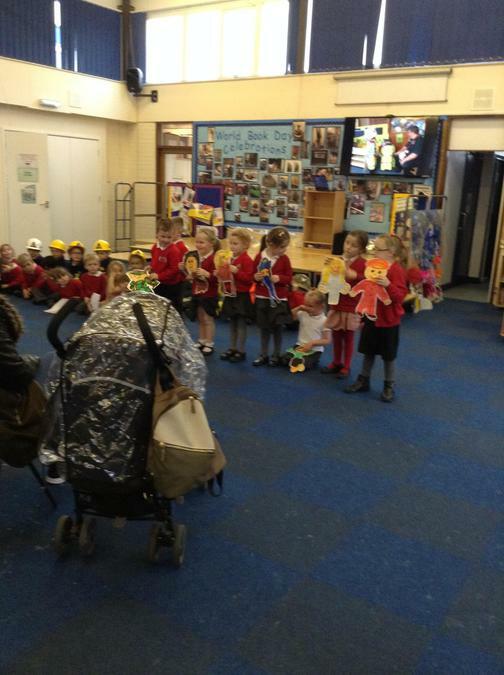 On Thursday we also enjoyed celebrating 'World book day' altogether and the children all had a go at creating their own stories and verbally telling them through their own illustrations as well as having a go at writing them down, using all their phonic knowledge. 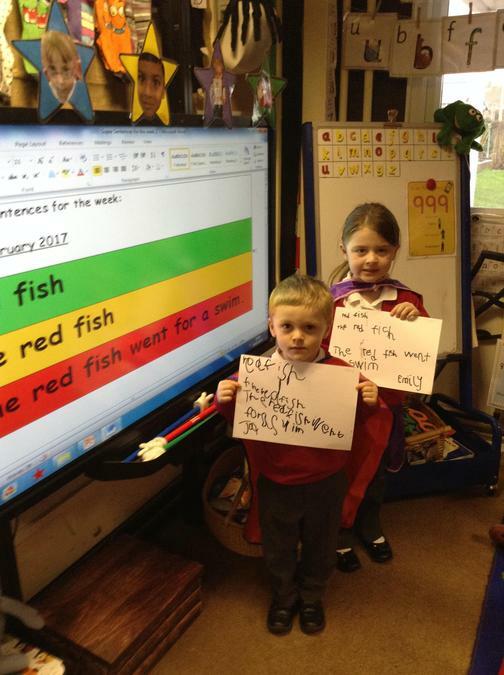 This week, the children have also started a new challenge, 'Super Sentence heros'. 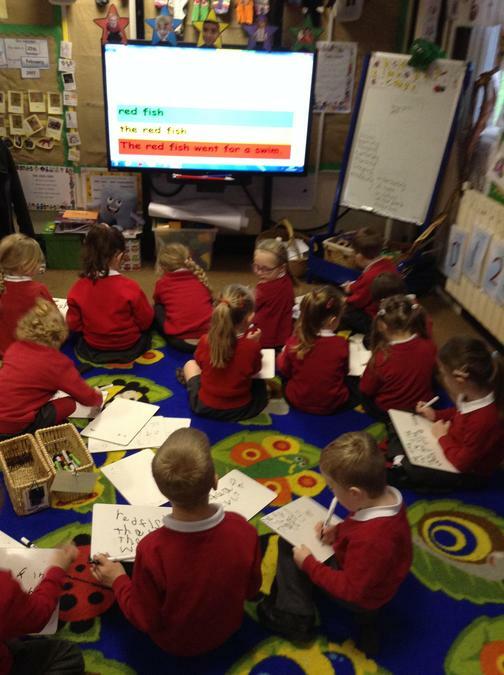 For this, every child is coming to class in the morning and getting their own boards and pens and then having a go at the green caption, using correct letter formation and trying to remember finger spaces, before they then go onto the orange caption and finally the super hot challenge of the red sentence, which includes a capital letter at the beginning and a full stop at the end. 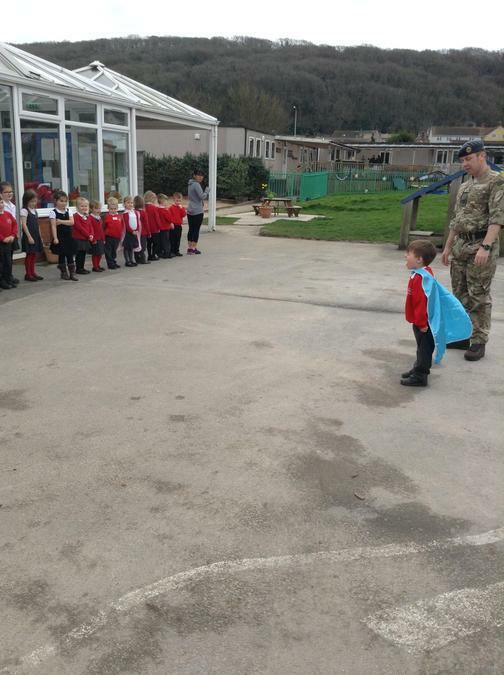 At the end of the week, there are two Super Sentence hero's that get to wear a cape for the day. 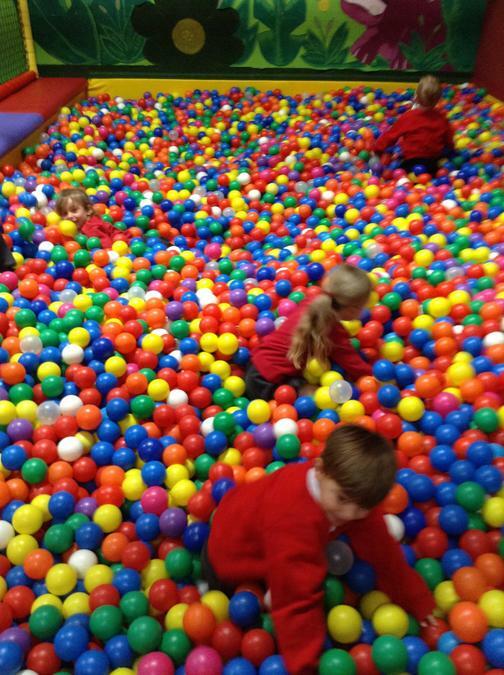 Reception Class have got a very exciting term ahead. 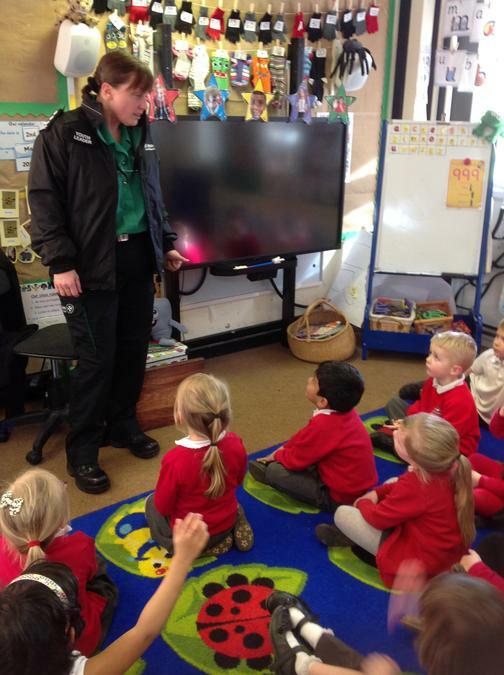 Beginning to combine all their learning and experiences together through the exploration of the topic 'People who help us in our community'. 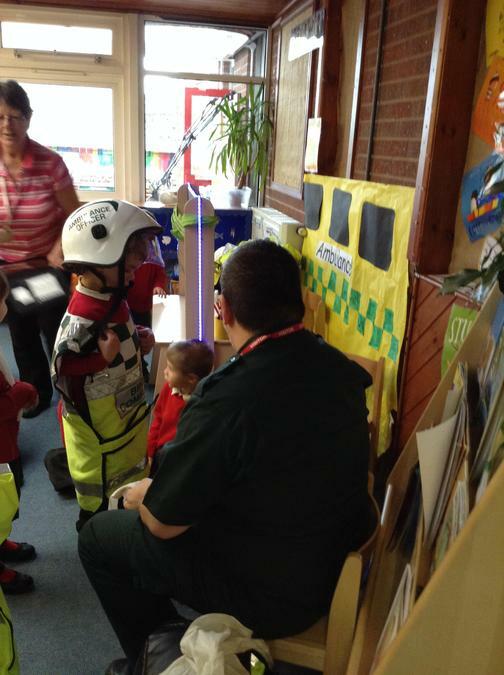 Our first WOW moment was a visit from some paramedics with their ambulance from a local station. 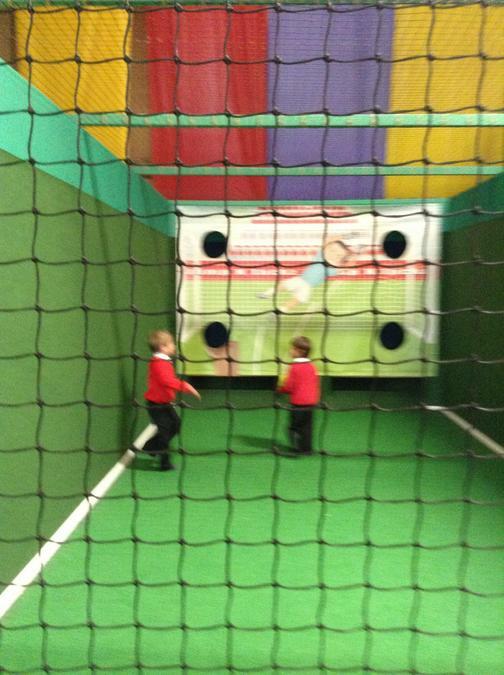 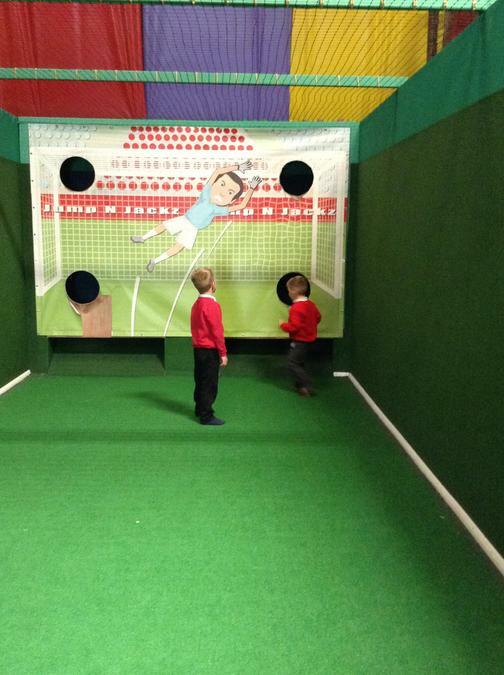 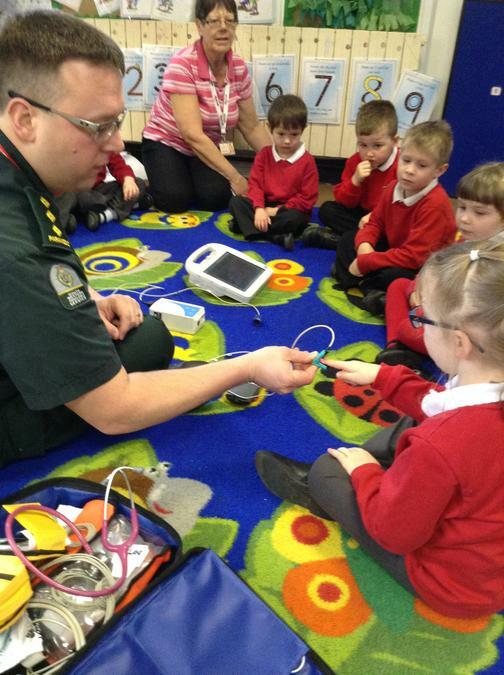 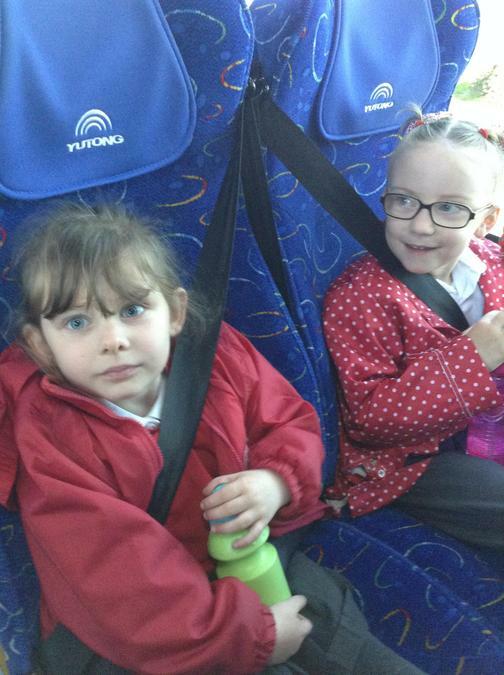 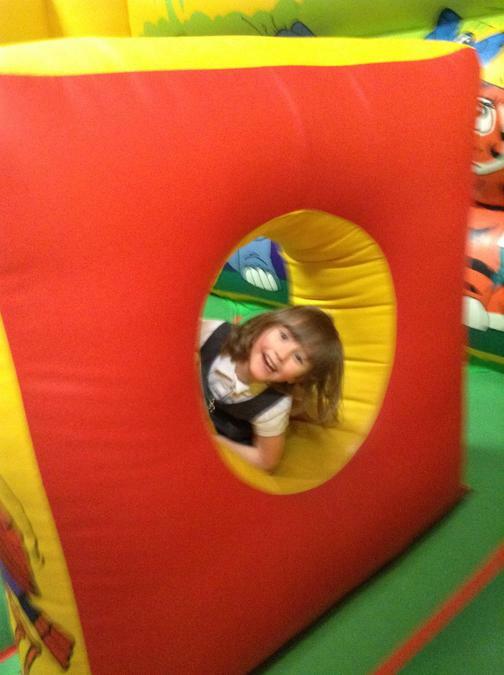 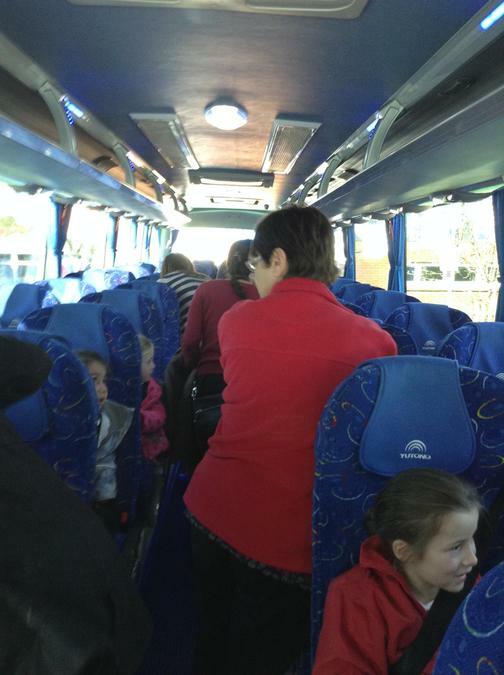 The children were fascinated with the equipment that was used and were brilliant listeners to all the information. 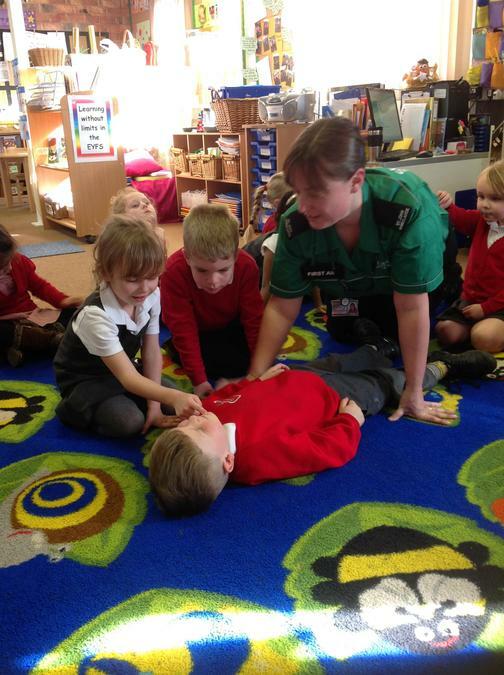 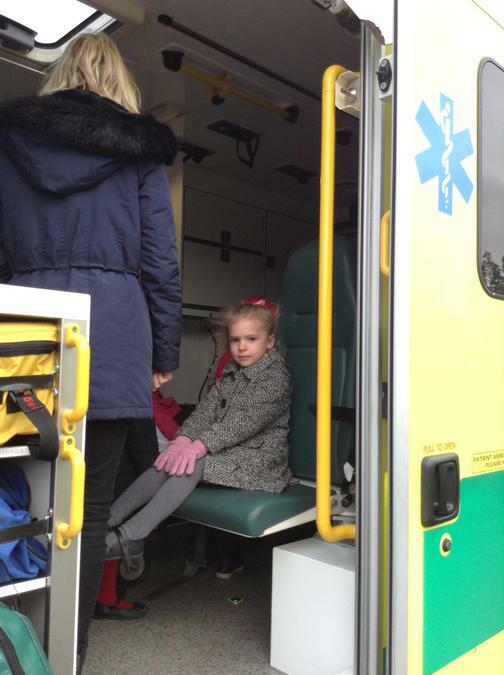 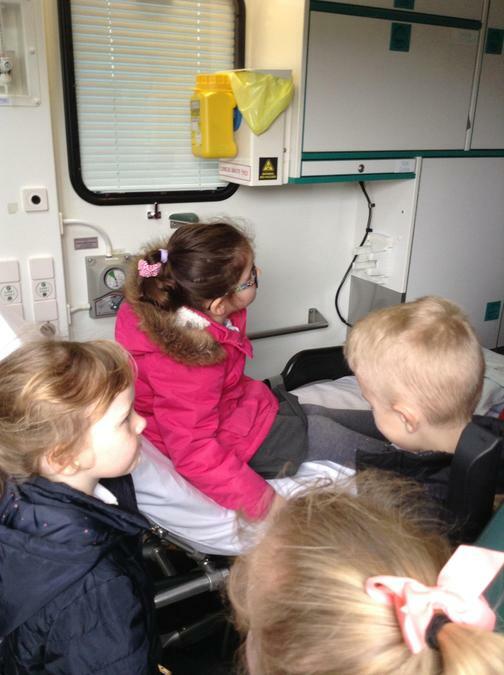 They learnt lots - even how to look after someone with a bad cut (put the persons hand over it to apply pressure) and then if someone was really hurt or poorly, how to dial 999 and ask for an ambulance and saying where they were. 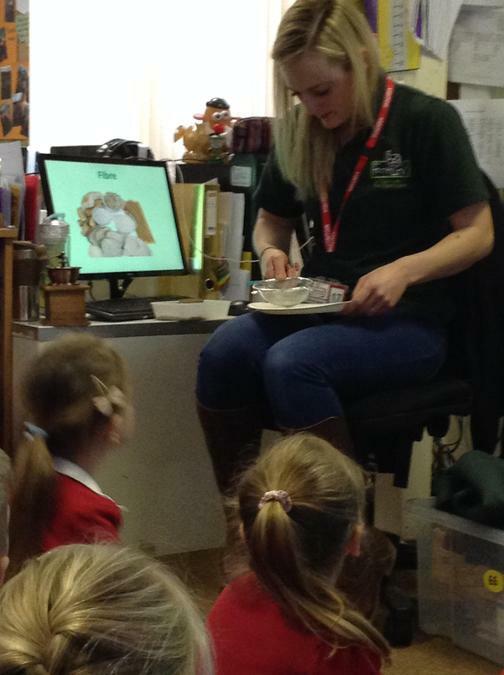 The second visit of the day was from a Vet. 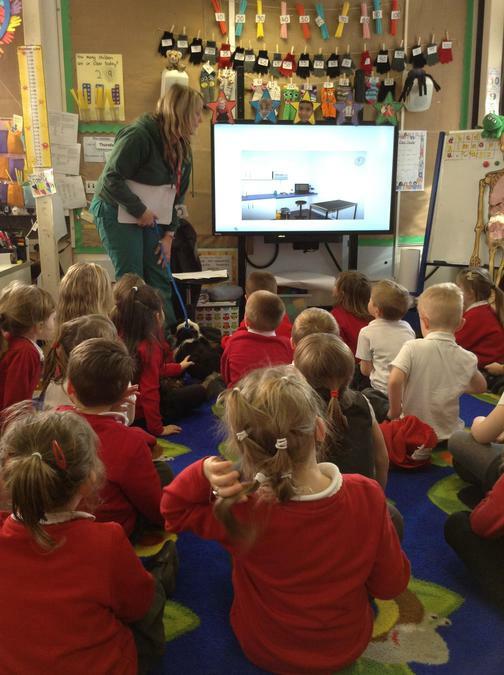 The Vet showed them some pictures about where they were and what they did in the surgery. 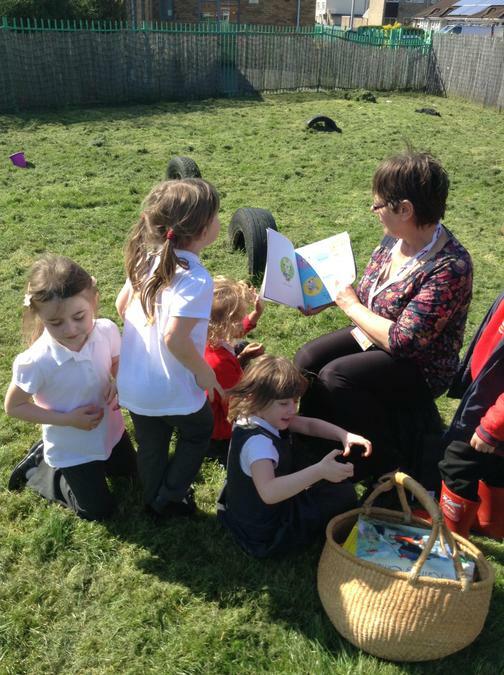 How they helped peoples animals if they were poorly and also how to help keep them well. 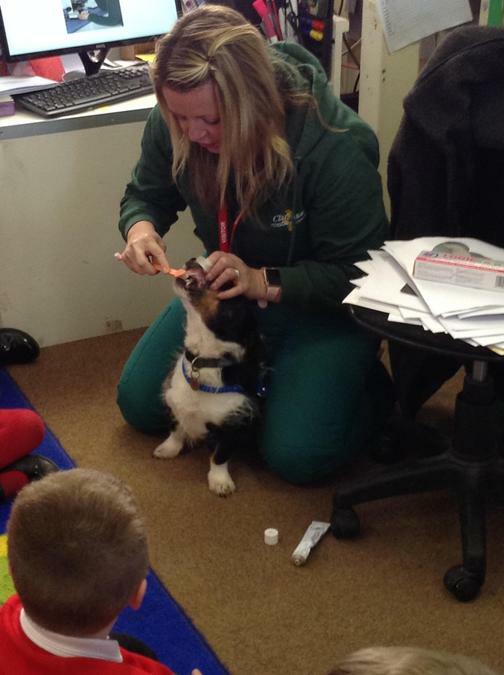 The Vet also brought a little friend, Stanley the dog. 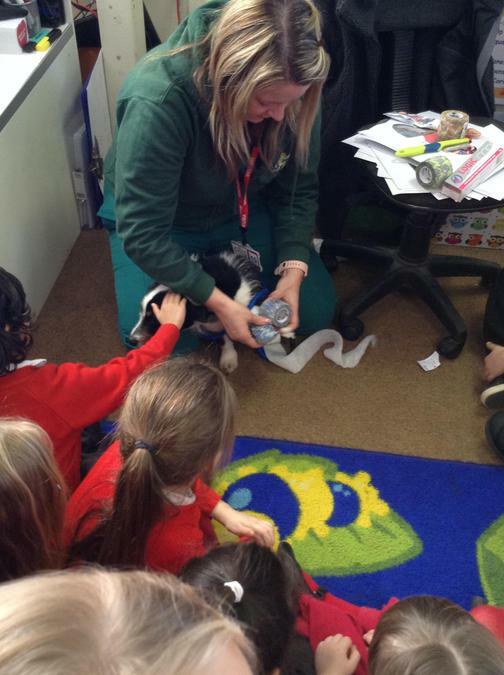 He was very well behaved and didn't bark once! 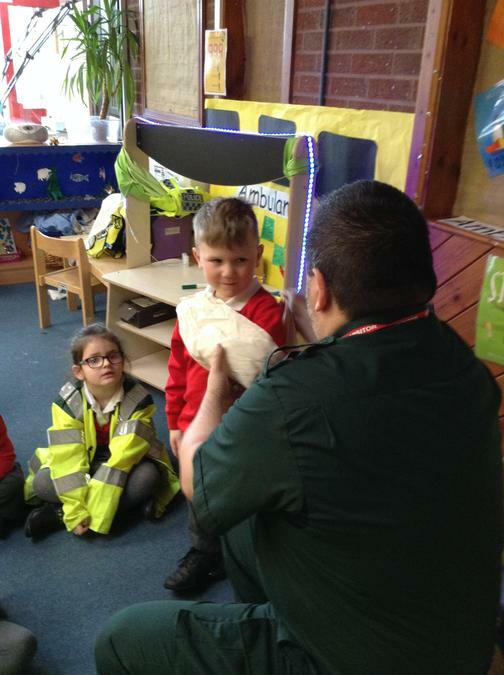 He showed us how to look after him, by brushing his coat, cleaning his teeth (with chicken toothpaste) and how bandage was applied, if he had a poorly paw. 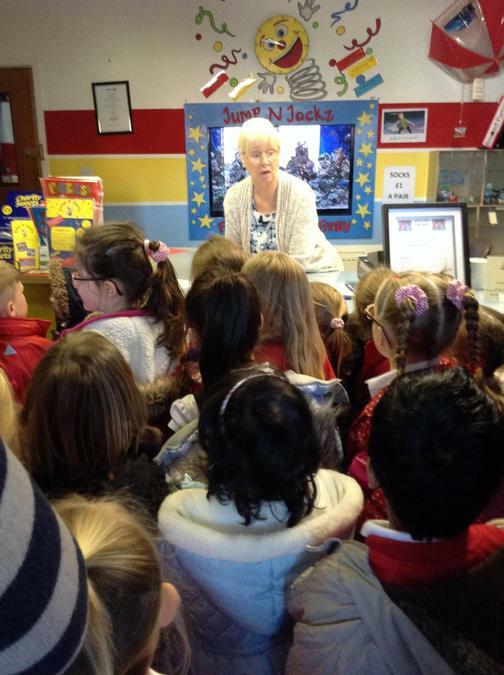 It was a really interesting talk and the children once again were star listeners. 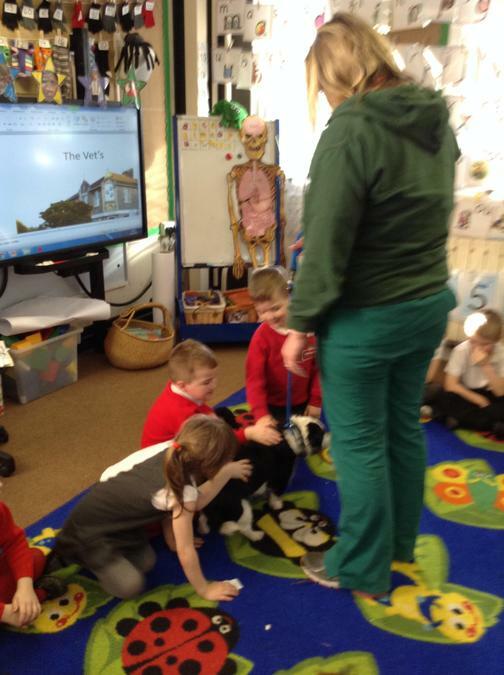 They all even got a chance to stroke Stanley; which he liked a lot! 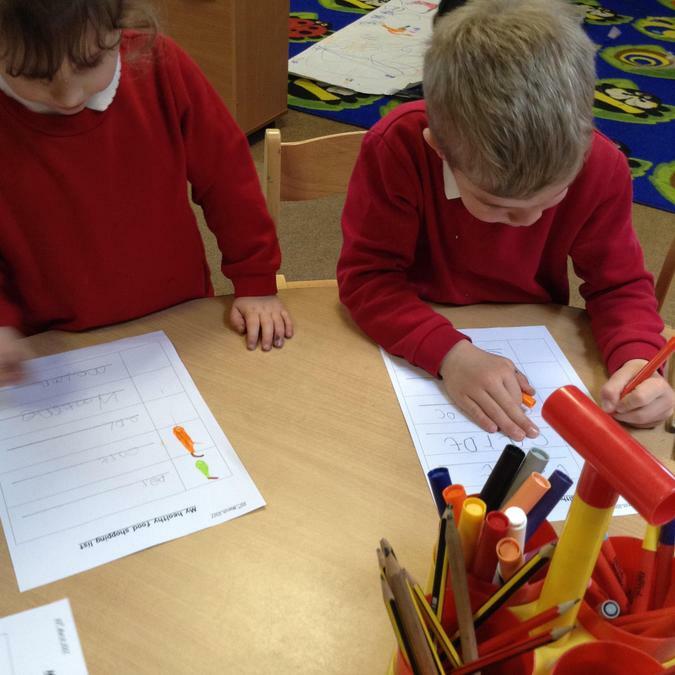 In literacy, the children had a go at starting to construct their own sentences to share their holiday news and in maths they have been concentrating upon making numbers over 10 and recording them in numicon and through written numerals. 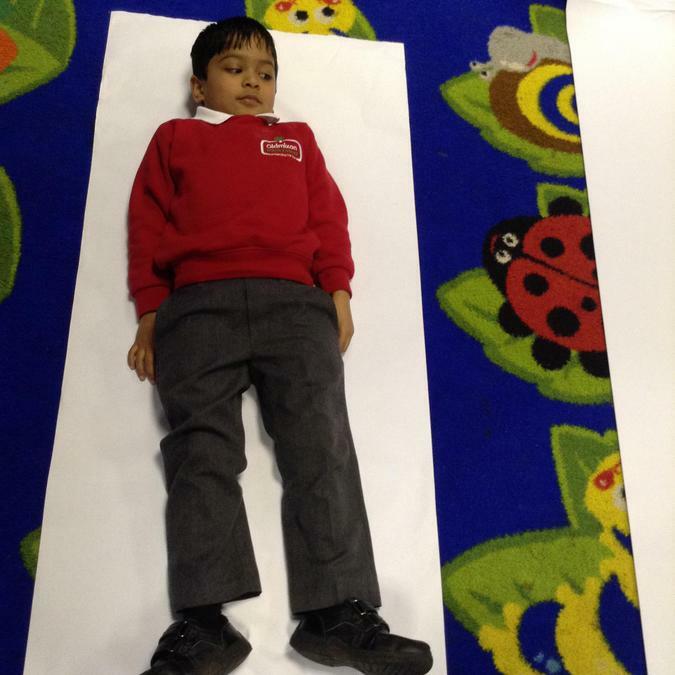 The children have shown great interest in the body and so we drew round some of the children and used our word mats and phonic knowledge to label different parts of the body. 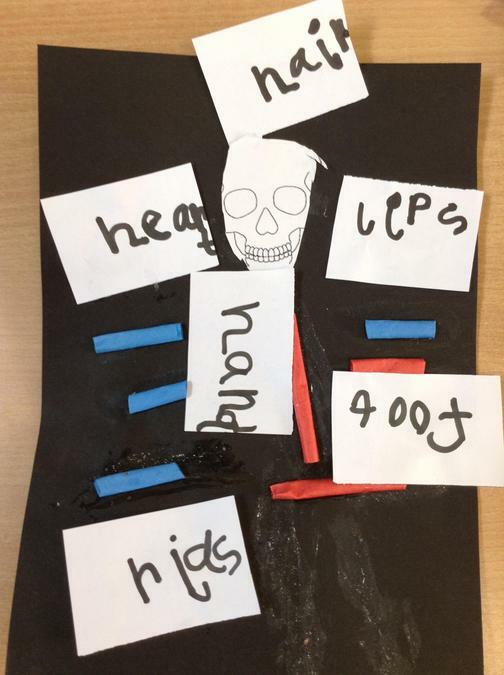 We learnt some of the names of the bones and where we could find them on our bodies and on a skeleton. 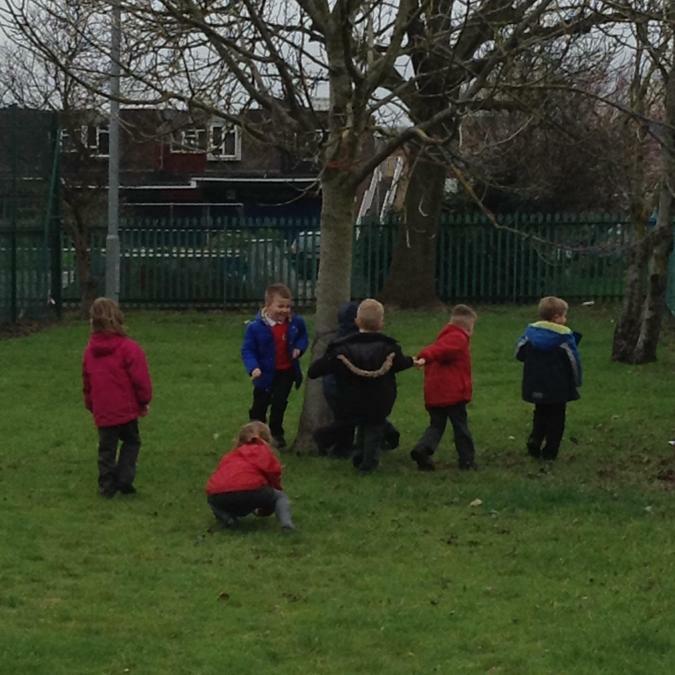 ...and buds on trees, daisies, old nests and longer grass. 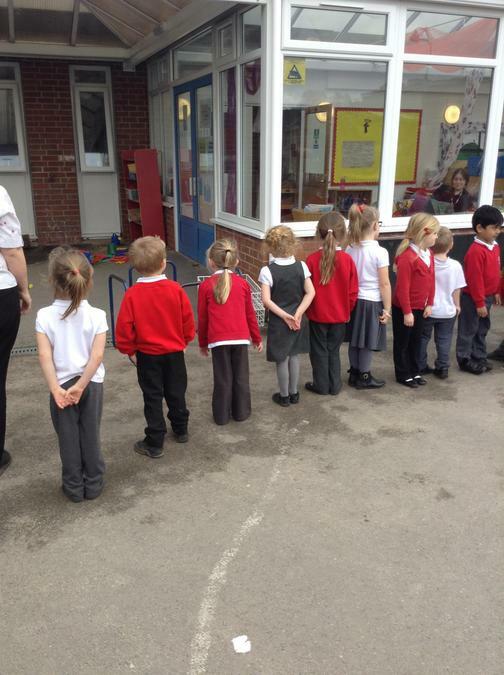 We decided that spring must be on its way, as i wasn't as dark in the mornings and evenings too. 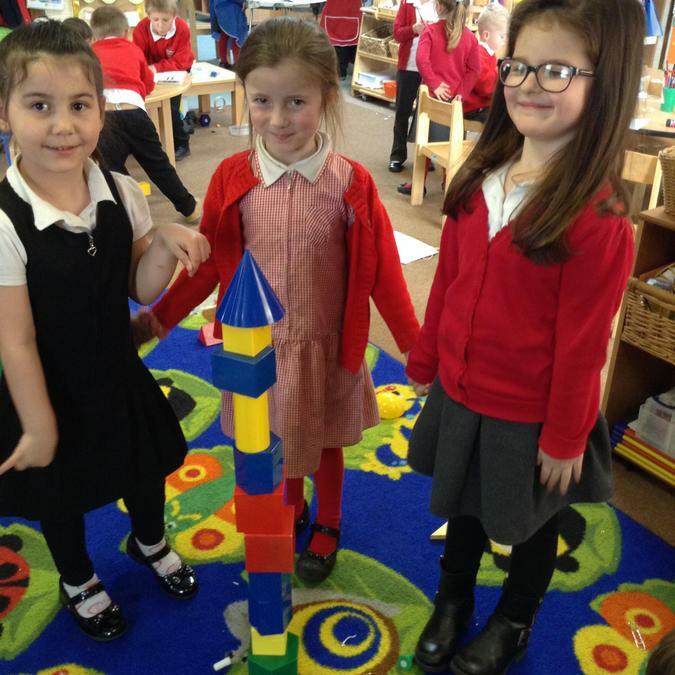 We are looking forward to using all our new experiences (and more visitors to come) to give us ideas to inspire our writing to share with you all soon.